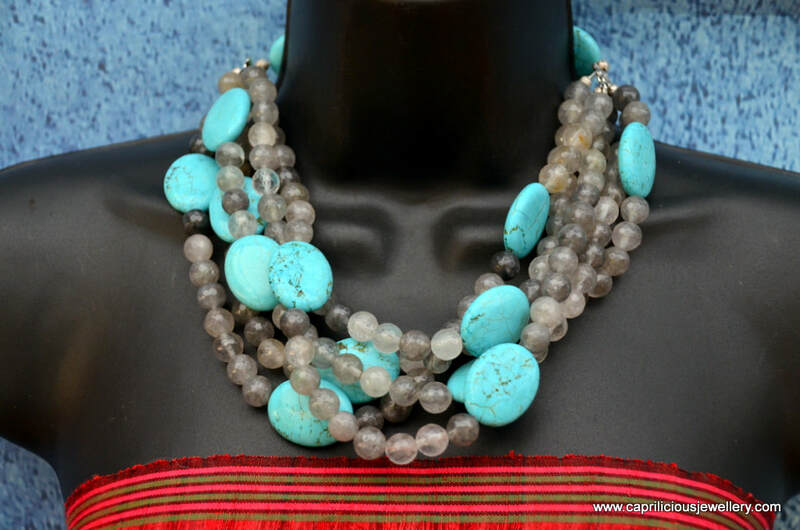 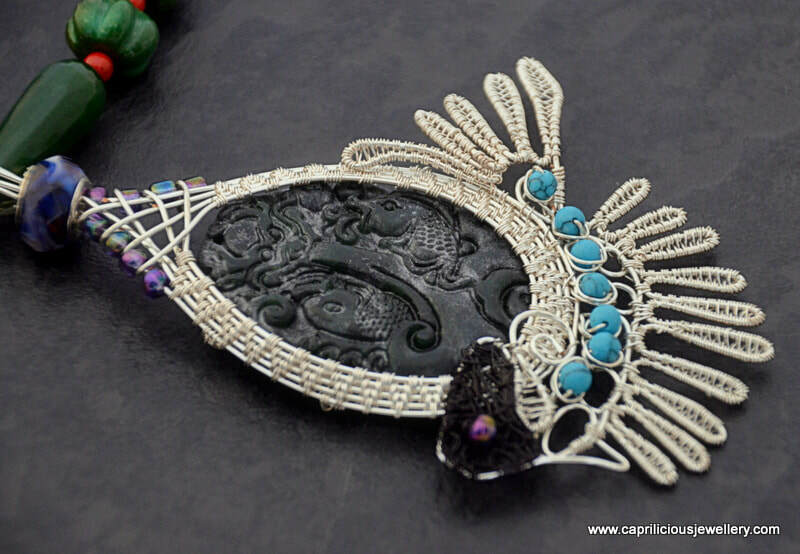 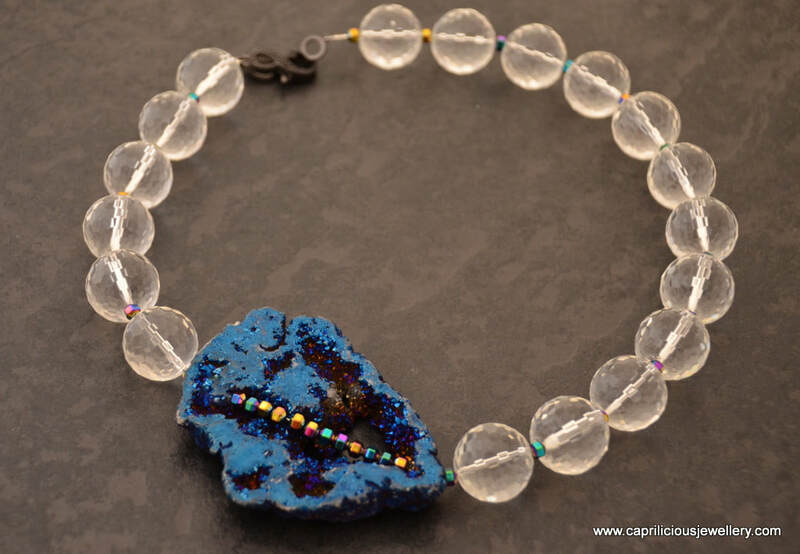 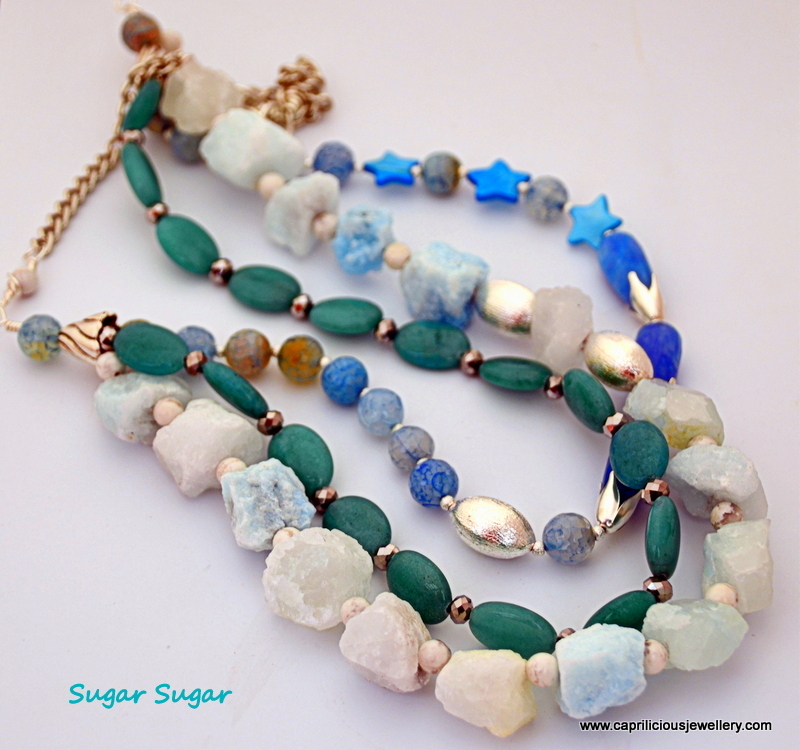 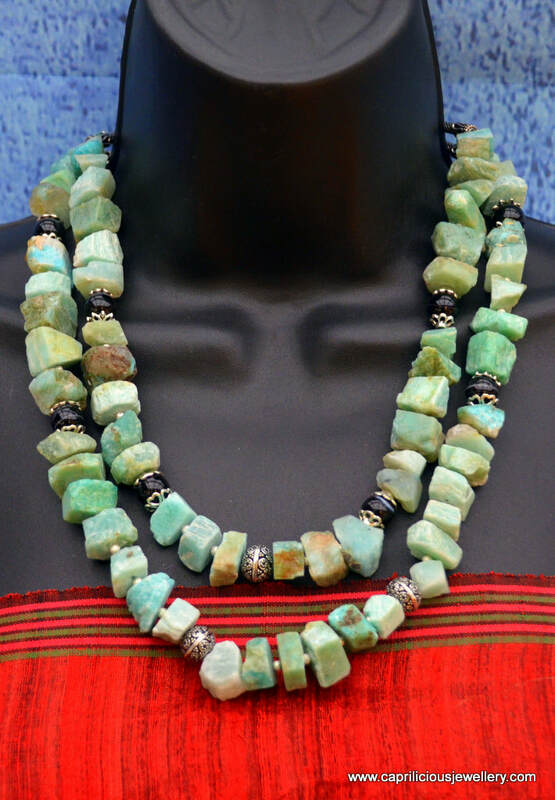 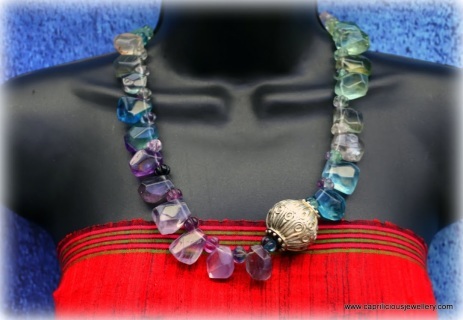 ​A collection of gemstone, bead and wire necklaces to delight you. 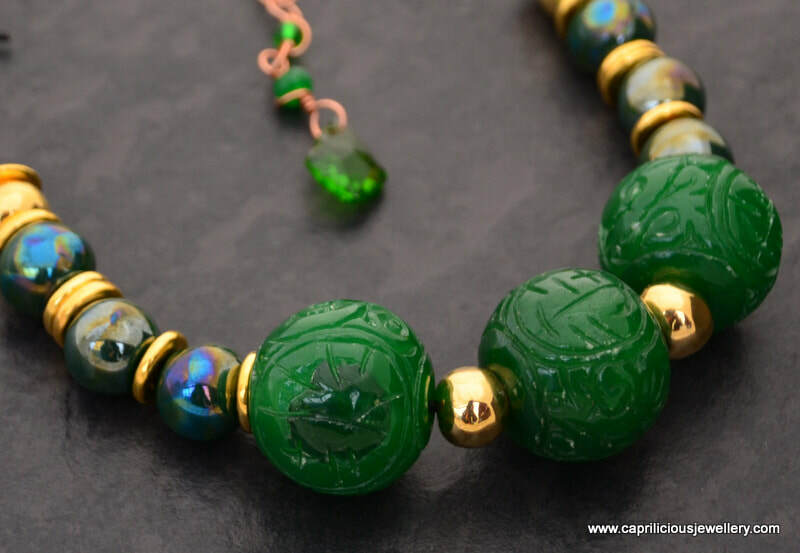 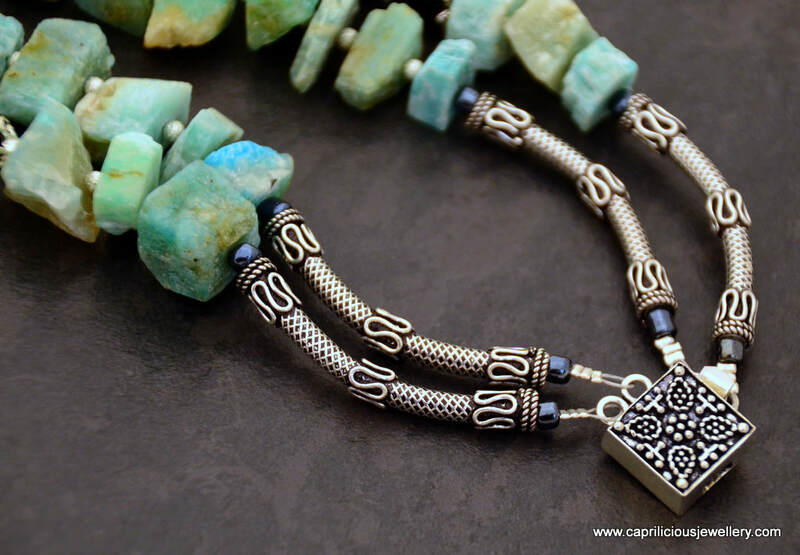 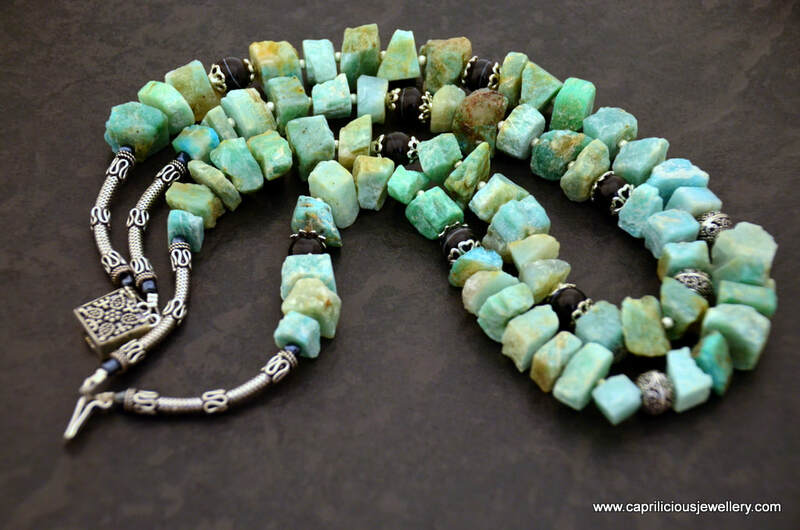 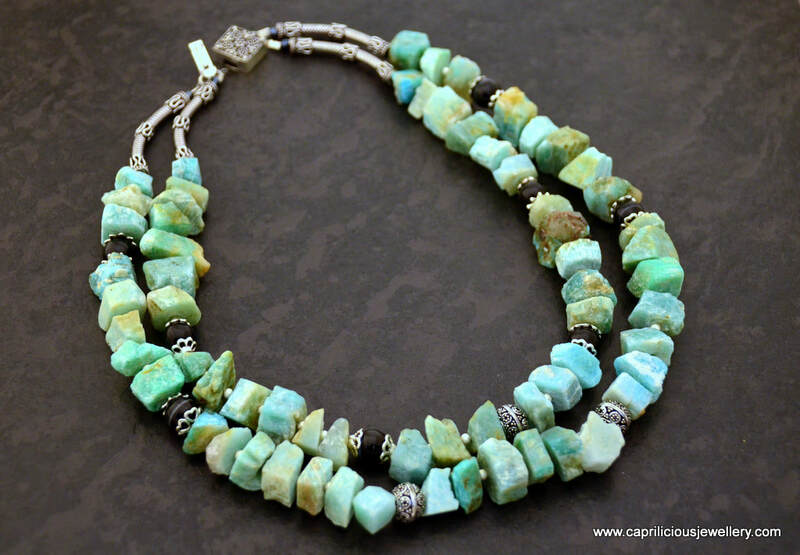 Caprilicious has a large collection of statement necklaces on this page, but don't forget to look at the other pages for more eye candy! 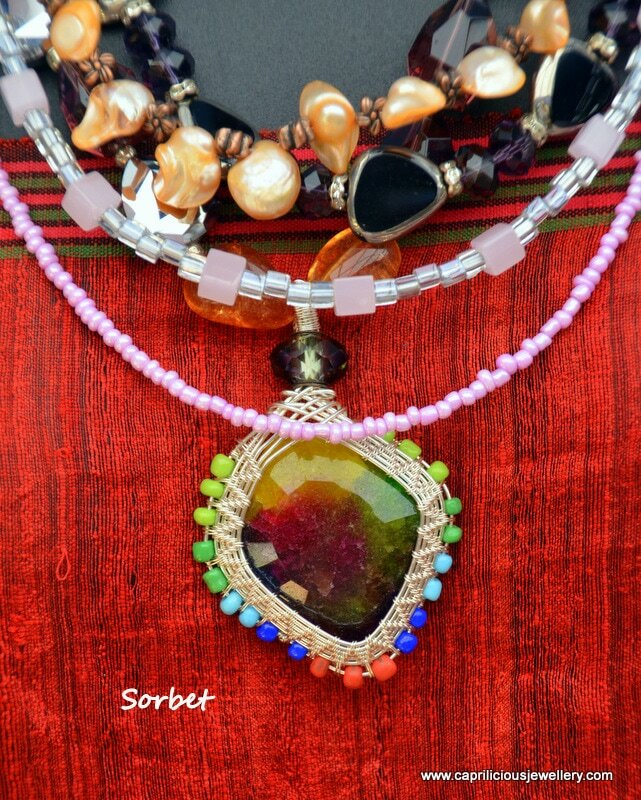 This is a necklace in two strands of creamy raw slabs of solar quartz, as well as a few that have been dyed in ice cream colours. 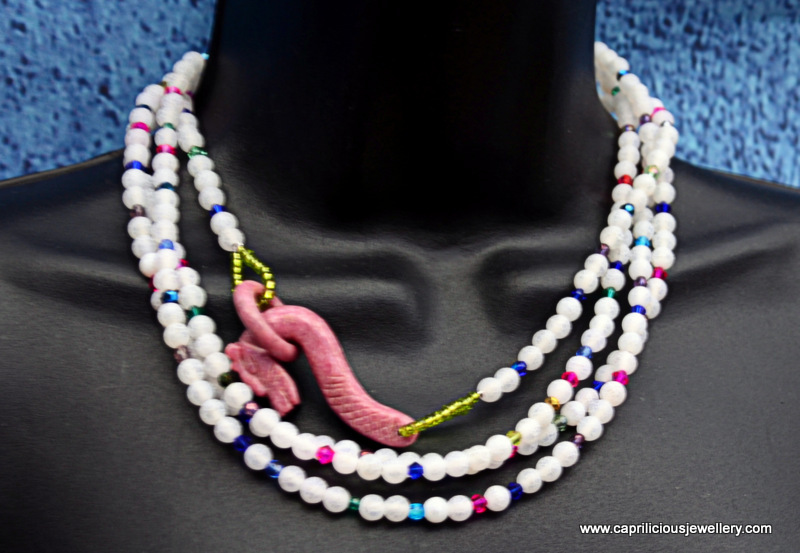 They are interspersed with creamy freshwater pearls, which have been placed close to the neck at the back for comfort. 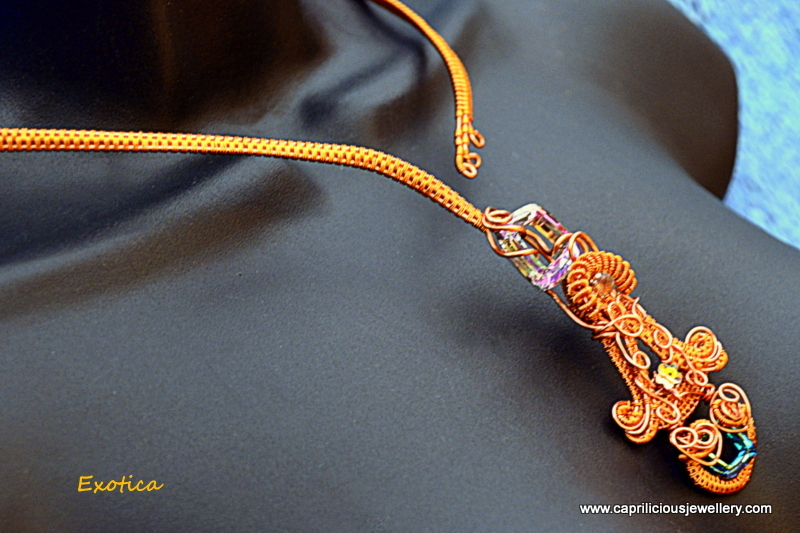 An ornamental hook clasp finishes the necklace which is 18" long. 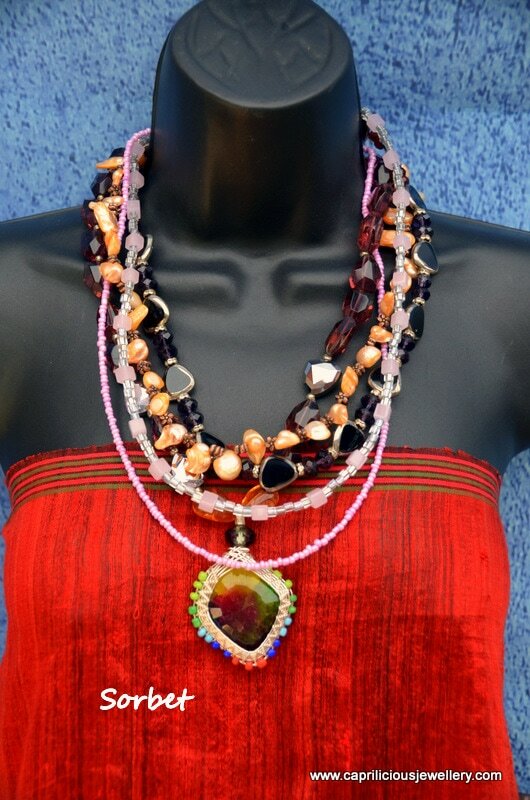 Very summery, and will go with all your summer dresses, floaty frocks, straw hats and can be worn to weddings and the races with equal aplomb. 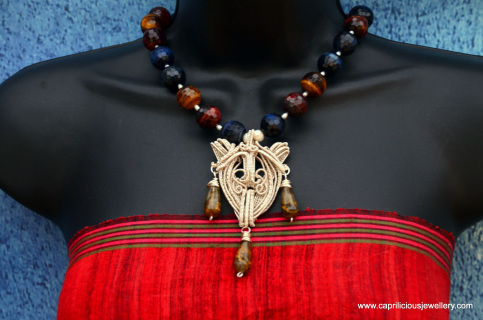 This one is my pièce de résistance for 2018 - the most complicated and beautiful pendant I have made this year, on a necklace of tiger eye beads that seem to glow with an inner fire, separated by little seed pearls. 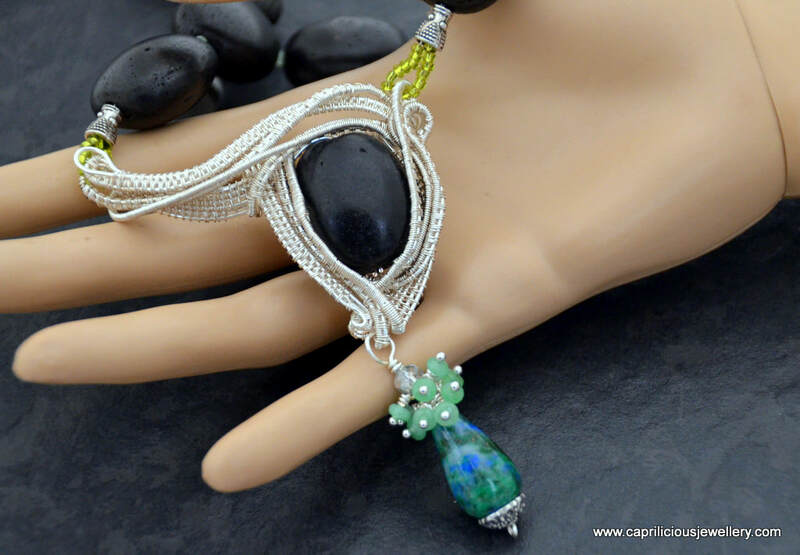 Three tourmaline tear drops drip from the angles of the pendant, made in layers of silver plated tarnish free wire, which although multilayered, remains slim and sleek. 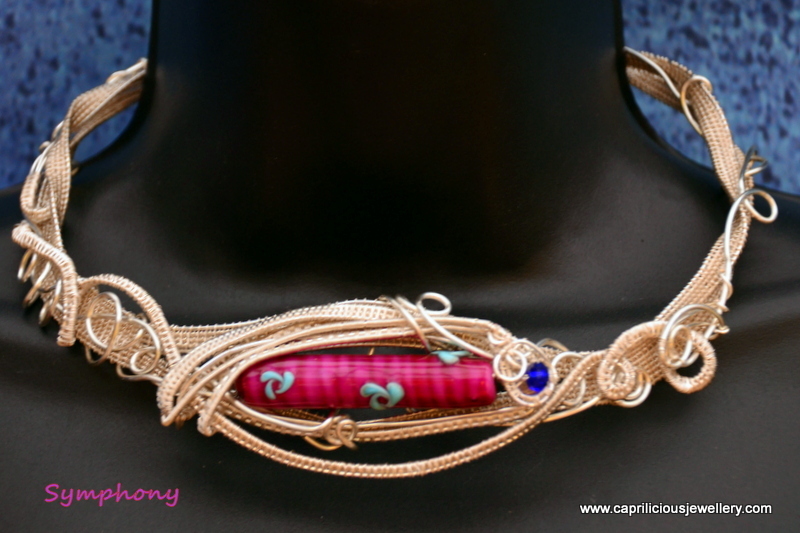 The necklace is finished with a beautiful box clasp that holds a ruby. 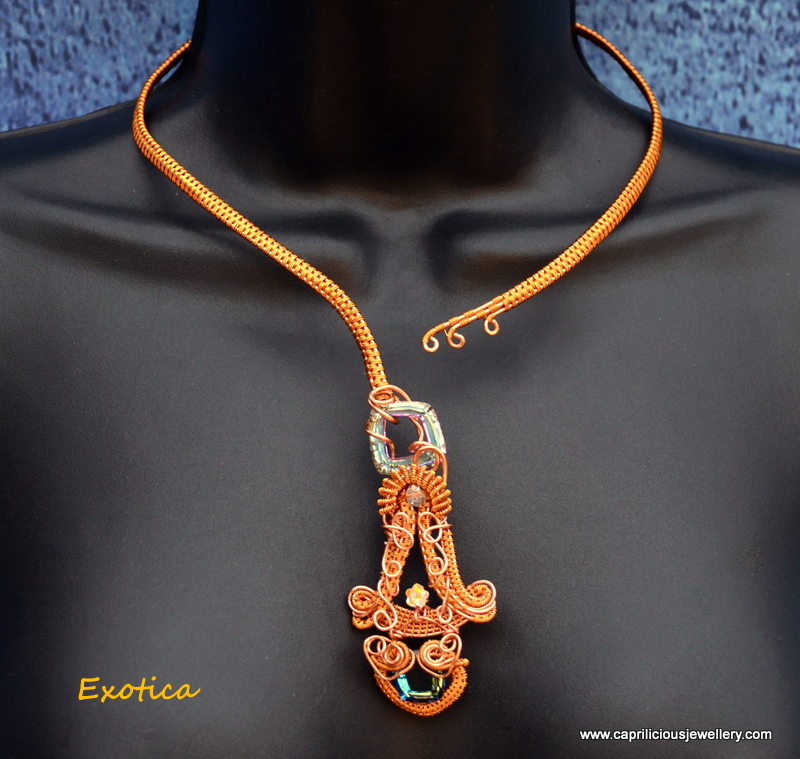 21" long, and the pendant is 2.8" x 2.5"
A wire doodle bib necklace with a long handmade extender chain ensuring that you can wear it at various levels, depending on your neckline. 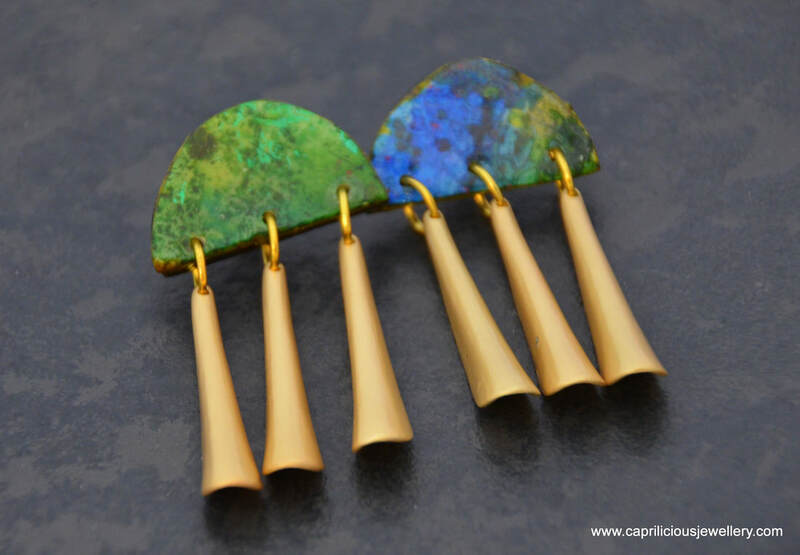 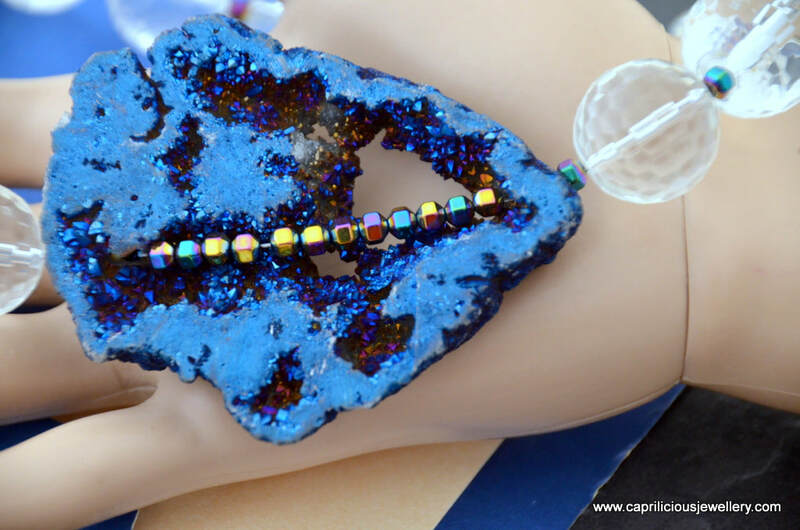 A beautiful colour-enhanced blue druzy cabochon is set to one side of the piece, anchored down with a wire rose and leaf and a couple of tiny Brazilian rubies. 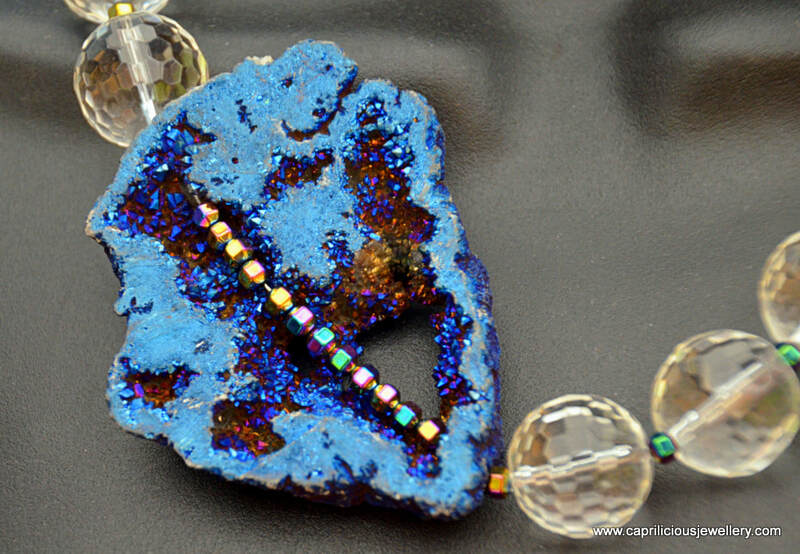 The druzy glints in the light and adds to the beauty of this lovely piece. 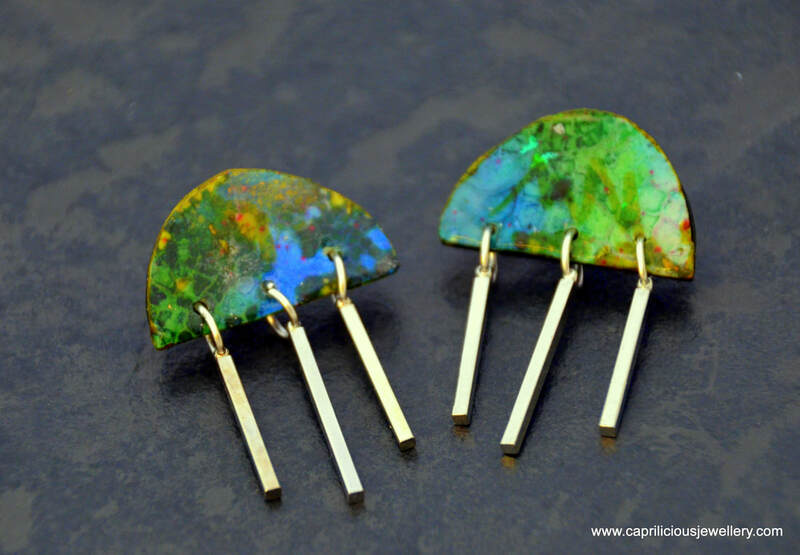 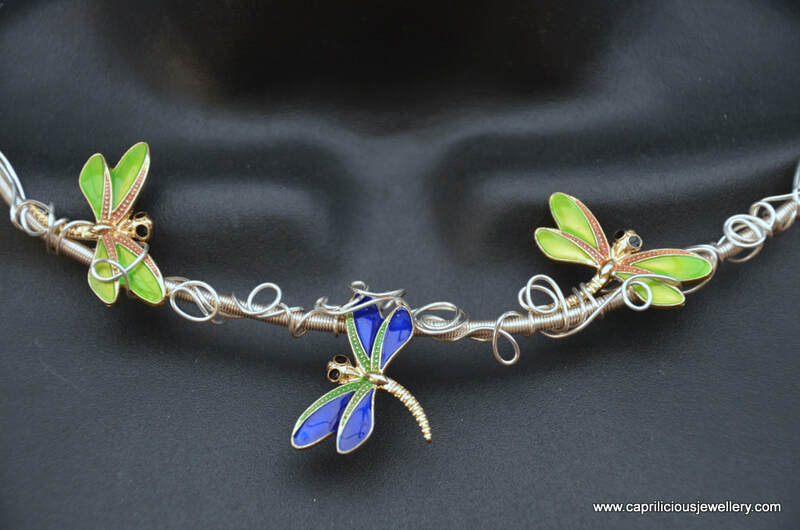 Made with mixed metals, both of them enamel coated and therefore tarnish free. 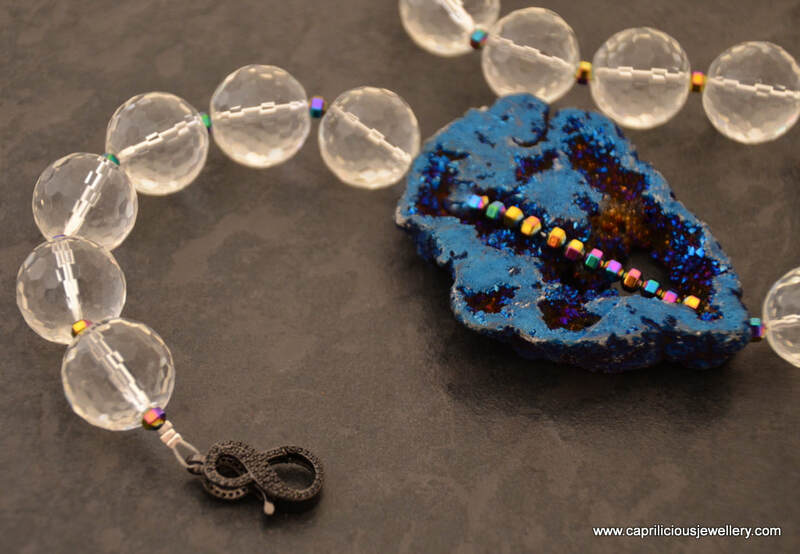 The handmade chain is enhanced by clear crystals and a hook mechanism effects closure. 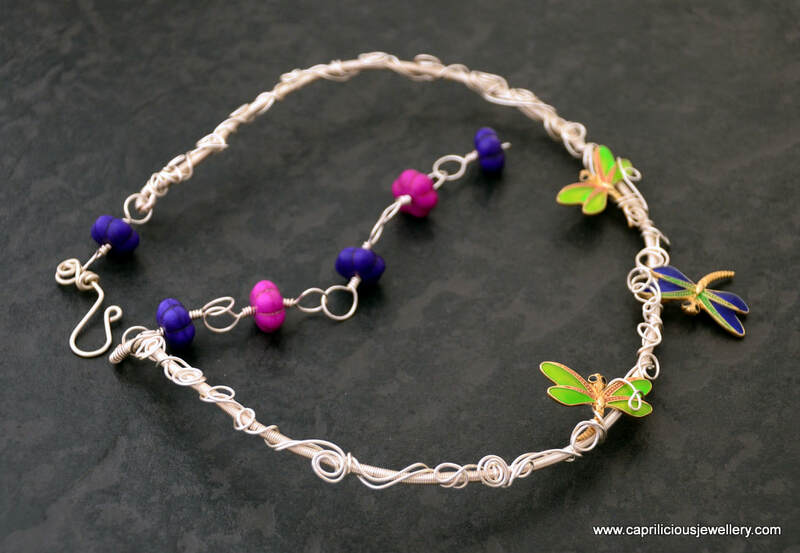 This will be a piece that can be worn to work as it is very simple, light and easy to wear, and can even be worn over a roll neck by simply increasing the length of the extender chain so that the piece hangs a bit lower. 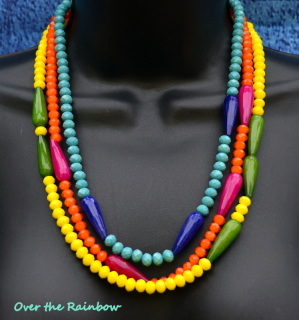 Of course, it will look lovely on an evening out, so it is very versatile. 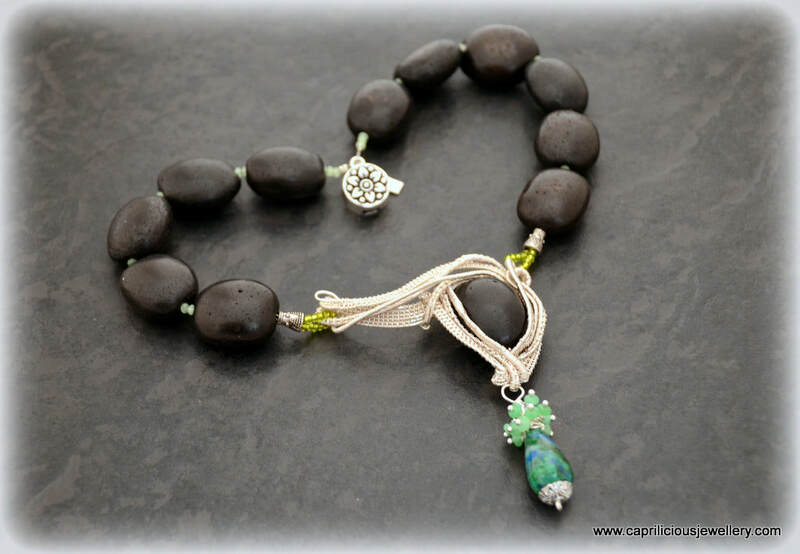 Raw aventurine nuggets in two strands, offset by shiny black agate beads - texture, contrast and colour in this fabulous statement piece. 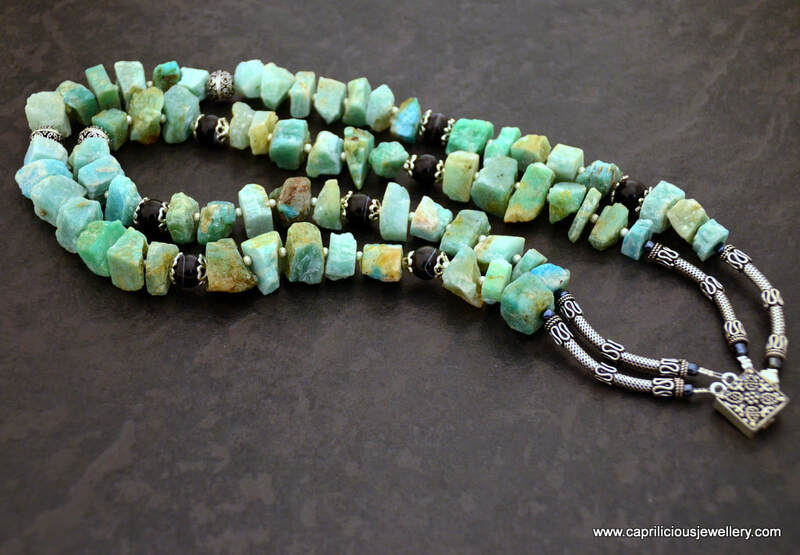 Silver tone spacers and a beautiful box clasp make this a very wearable necklace, 21" long, for a day that requires a chic and expensive statement, without being too colourful. 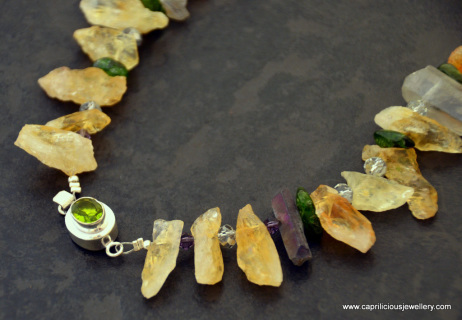 Fabulous tactile chunks of raw citrine nuggets, silvery quartz points and moldavite, with crystal spacers that glint in the light in a simple but sumptuous necklace, that ends in a box clasp that is inlaid with a vibrant peridot. 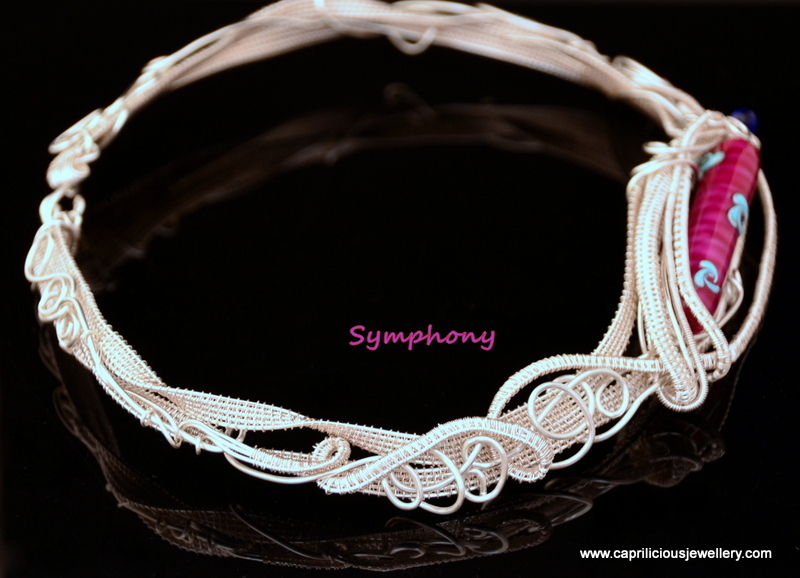 For someone who likes to make a quiet statement, and not as colourful as the pieces I usually produce, however, it has a genteel sophistication of it's own and will look great with autumn and winter colours. 22" long, in six vibrant strands - titanium plated purple quartz needles with contrasting bamboo coral spike beads, Czech glass and crystal in green to create a pleasant springlike harmony. 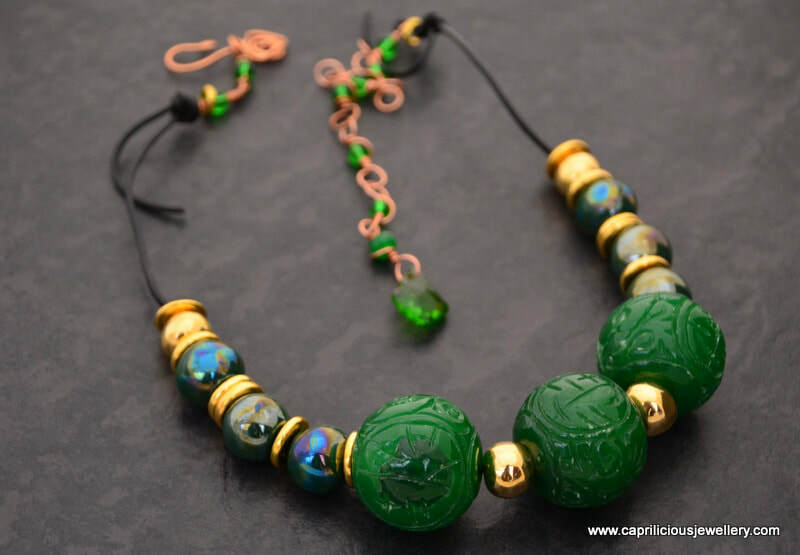 The necklace carries a beautiful citrine glass acorn with a gold plated bead cap and ends with a handmade copper hook and chain which creates an extension of about 3" should you wish to wear the necklace longer. 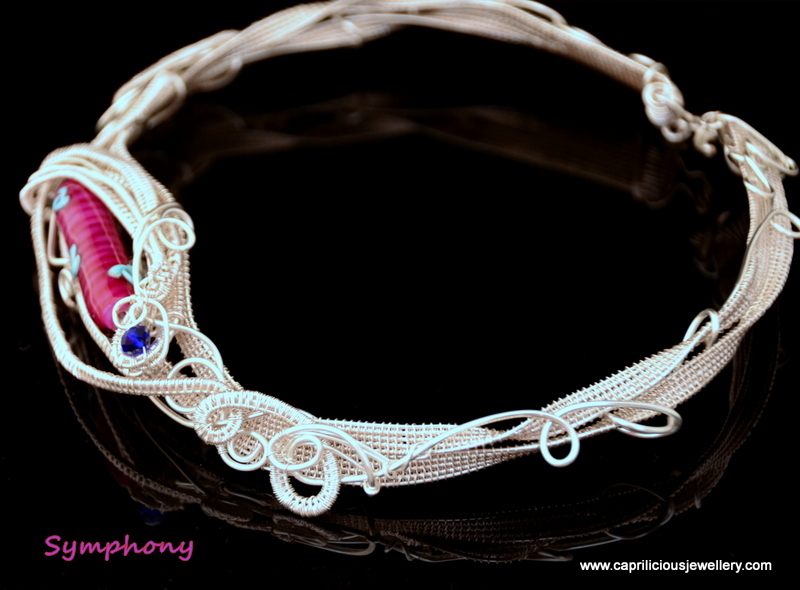 A baroque crystal drips from the end of the chain to prettify the back view of the necklace. 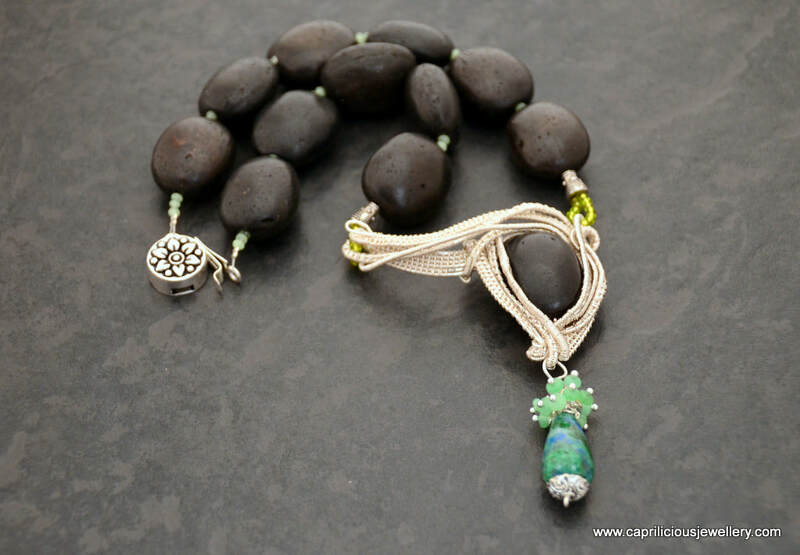 The black beads in this necklace are hollow ceramic beads, with pale green crystals between them. 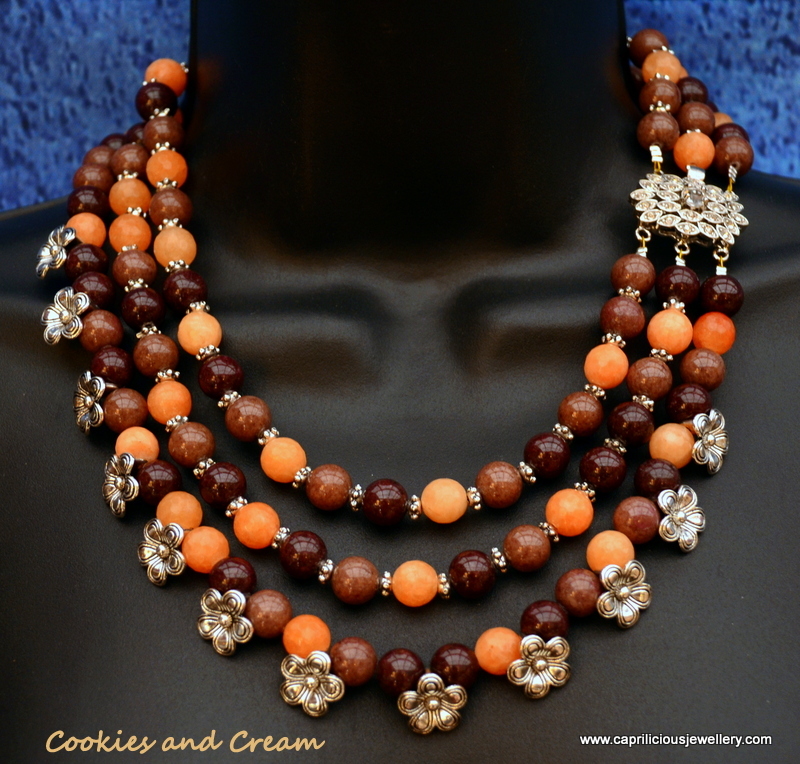 The necklace sits close to the neck, with an ornate box clasp to close, at 18.5". 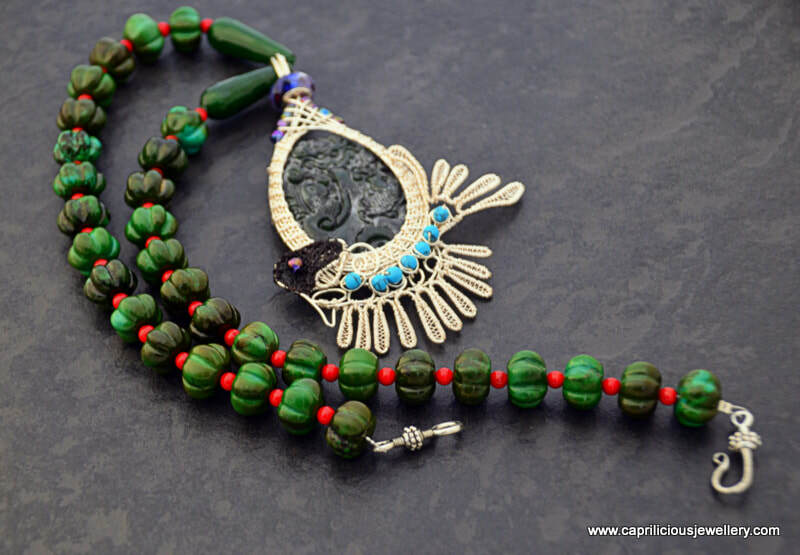 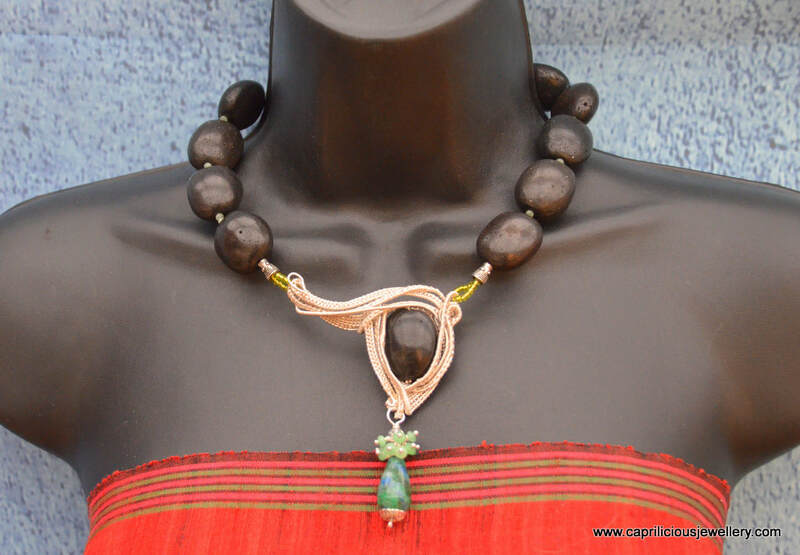 The pendant has yards of wire wound back and forth around a black ceramic bead with a chrysocolla teardrop and little aventurine beads dangling from the pendant. 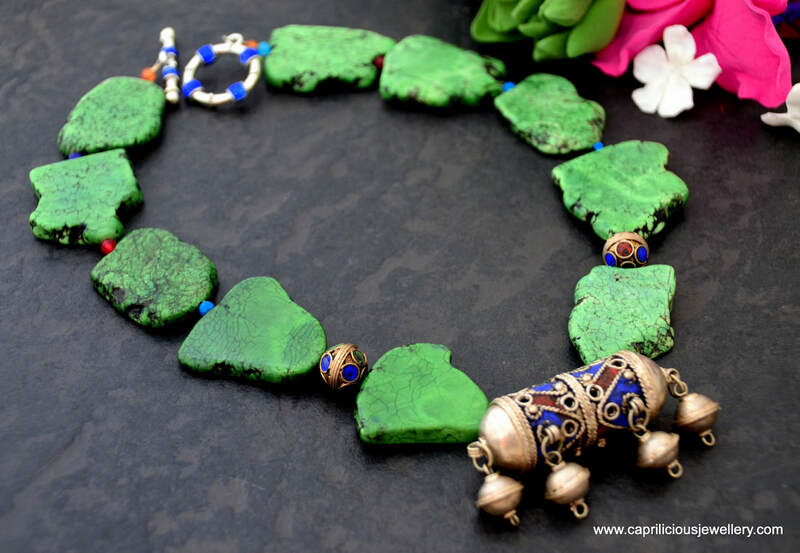 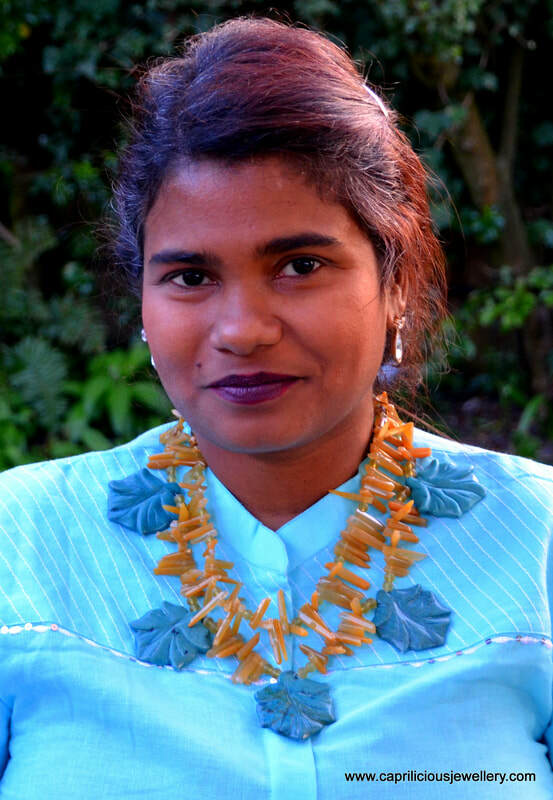 The pendant is asymmetrically pleasing to the eye and this necklace will suit a lady who likes an artisanal touch to her jewellery and appreciates the wonders of a handmade piece. 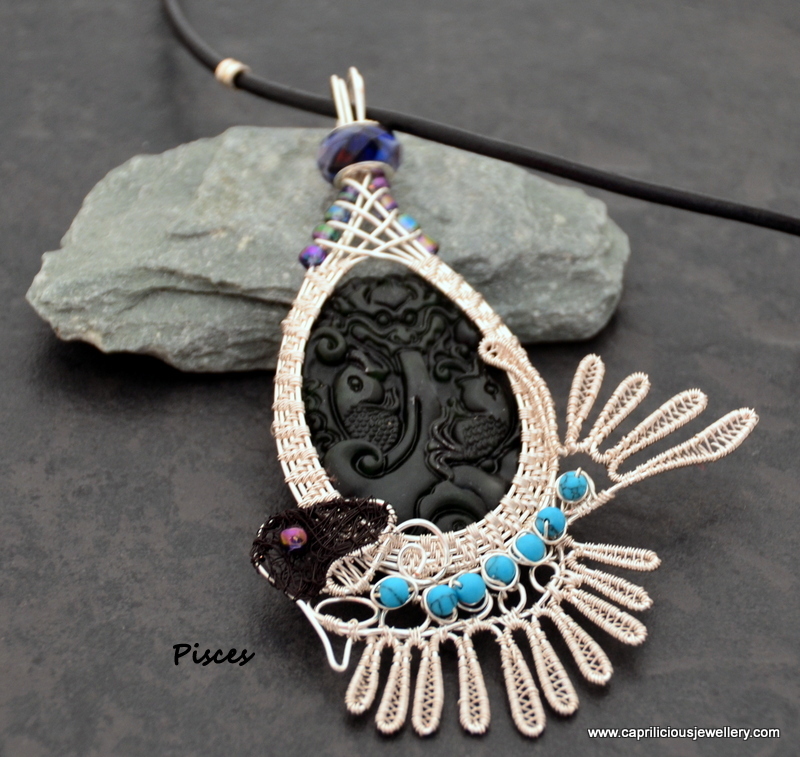 This pendant uses nine feet of the thicker wire and miles of fine wire - I couldn't measure it as I used it right off the spool. This is a beautiful day to night piece and will be much appreciated, I promise you that!! 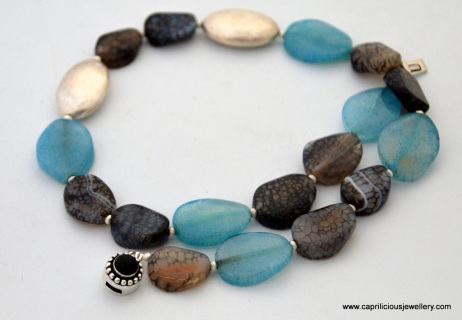 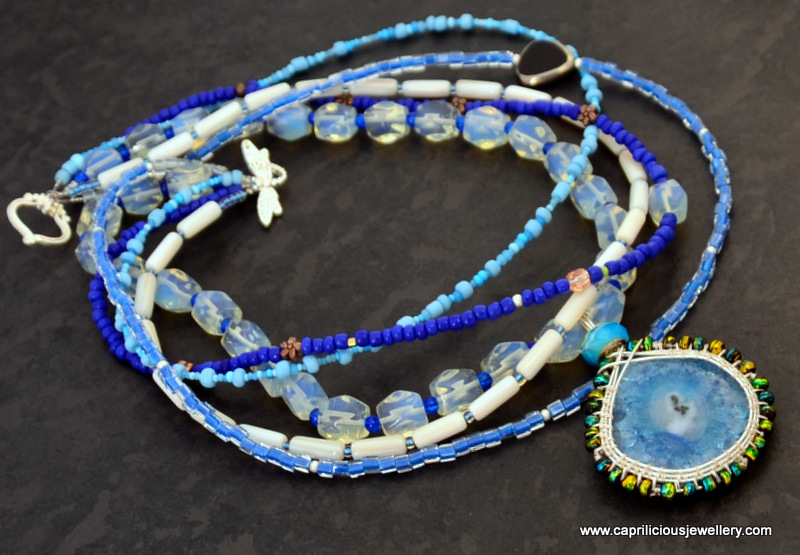 19" of beautifully marked grey dragons vein agate in this necklace, accented by pale blue agate which also has a delicate tracery of lines within. 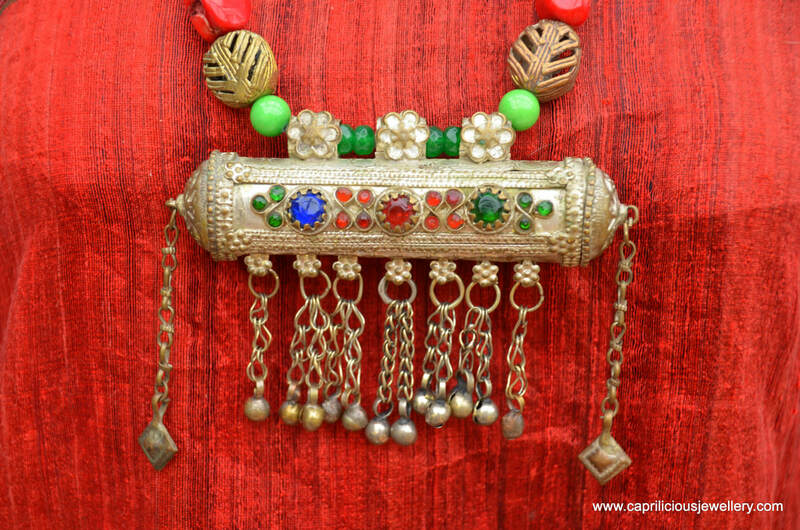 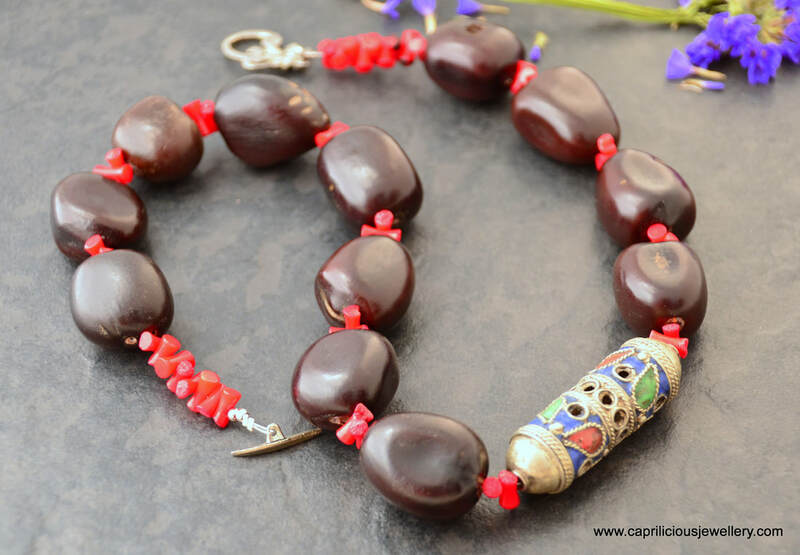 A couple of brushed silver plated copper beads and an onyx box clasp increase the beauty quotient of this piece which will look fabulous around your neck. Wear it to work and of an evening, a versatile piece that will take you anywhere. 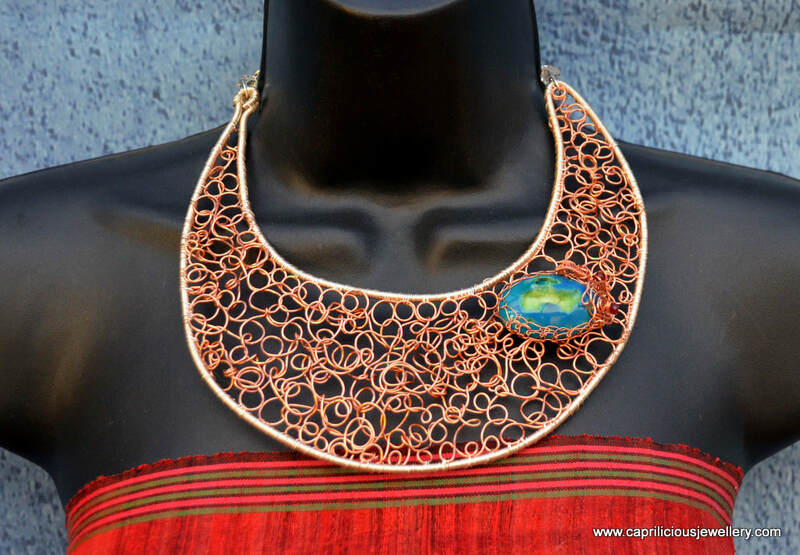 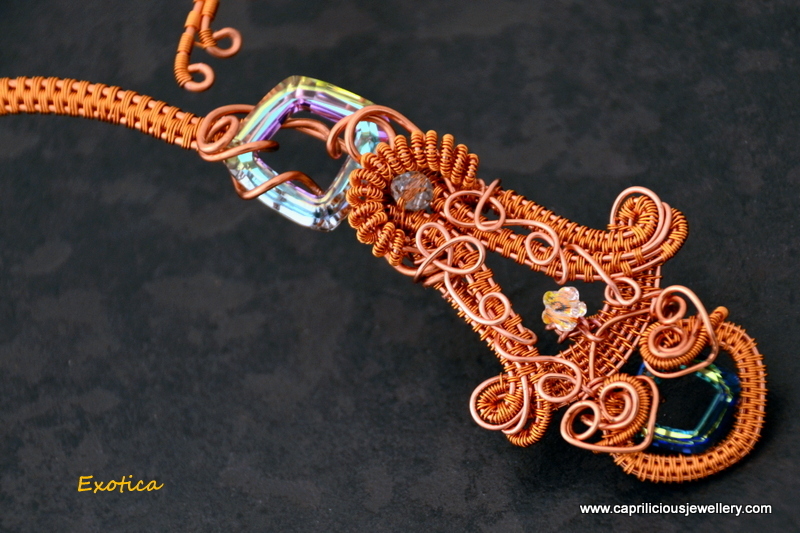 Copper wire and Swarovski crystals go into the making of this torque necklace. 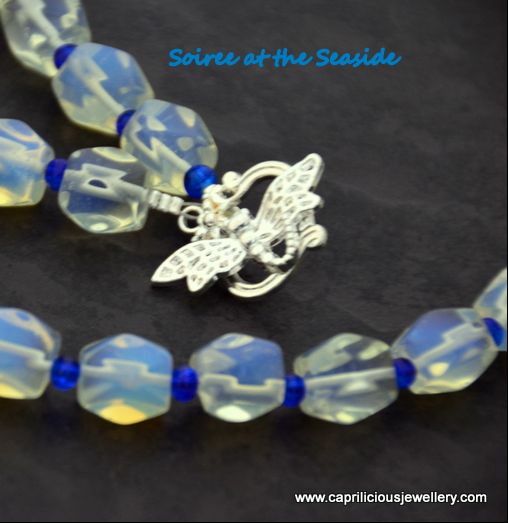 Swarovski cosmic squares in Bermuda Blue and Clear AB are placed at either end of the pendant, and a little Swarovski Marguerite embellishes the triangle of negative space. 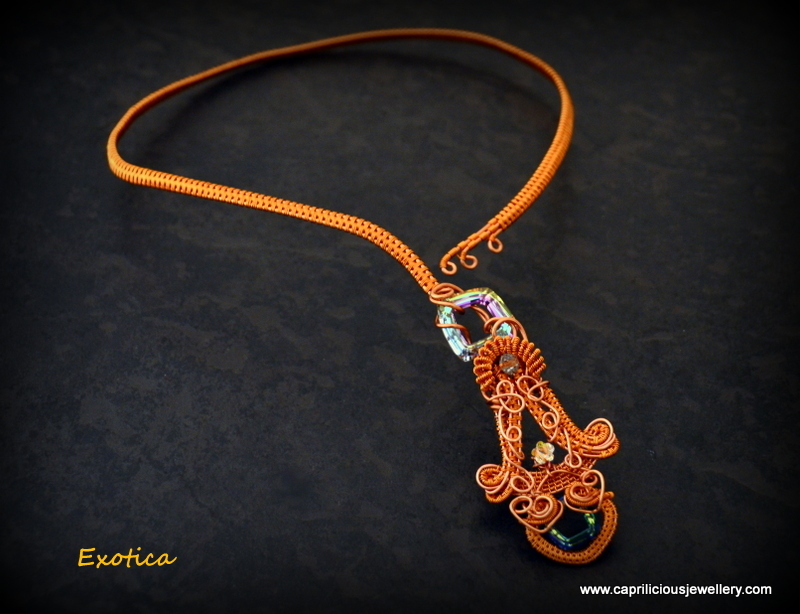 Wire weaves, swirls and coils embellish the pendant which can be moved to suit your neckline by adjusting the other end of the torque. 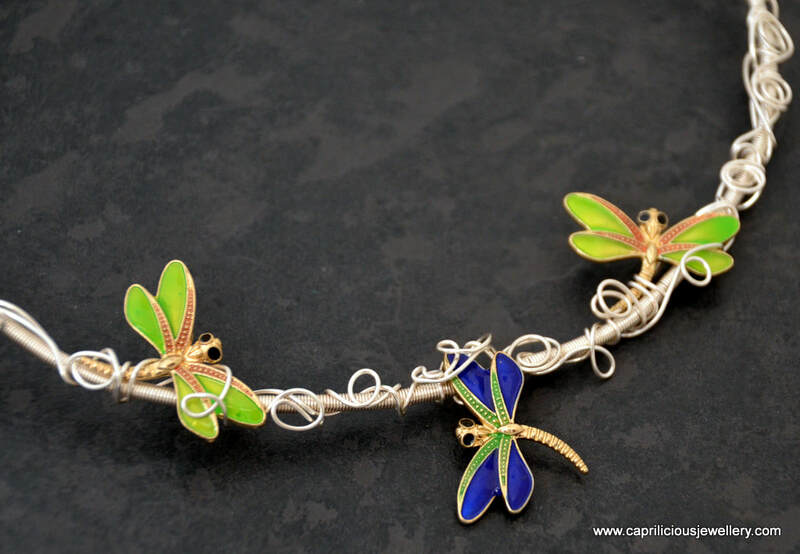 Non tarnish enamelled copper wire has been used throughout. 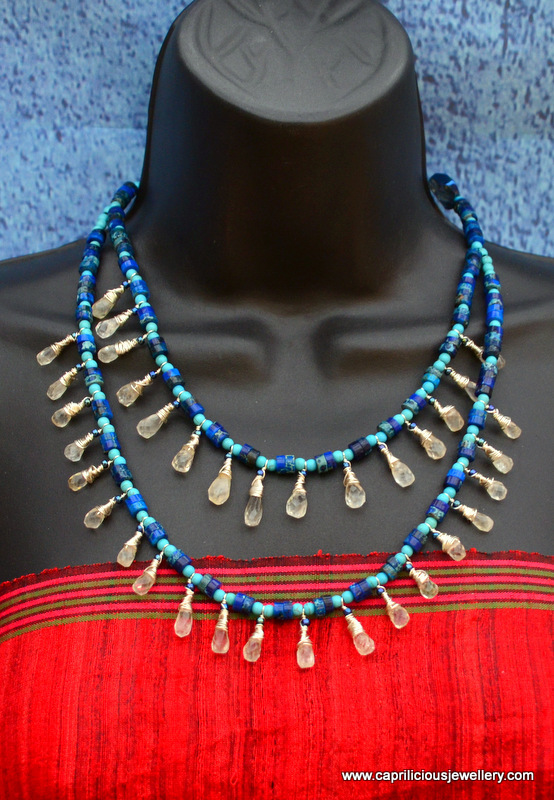 23" long this multistrand necklace is made from chunky opalite beads which glow in the light, interspersed with blue crackle quartz, cylinders of mother of pearl, and Czech glass seed beads. The five strands in varying shade of blue and white complement the ble solar quartz pendant perfectly and appear to be thrown together with careless abandon. 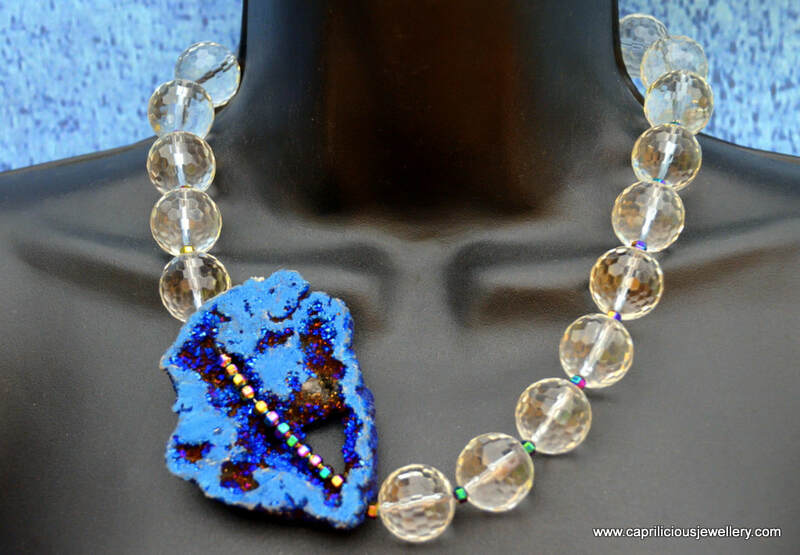 The pendant is a blue solar quartz, which is a slice of a stalactite, set in a wire and glass seed bead surround. 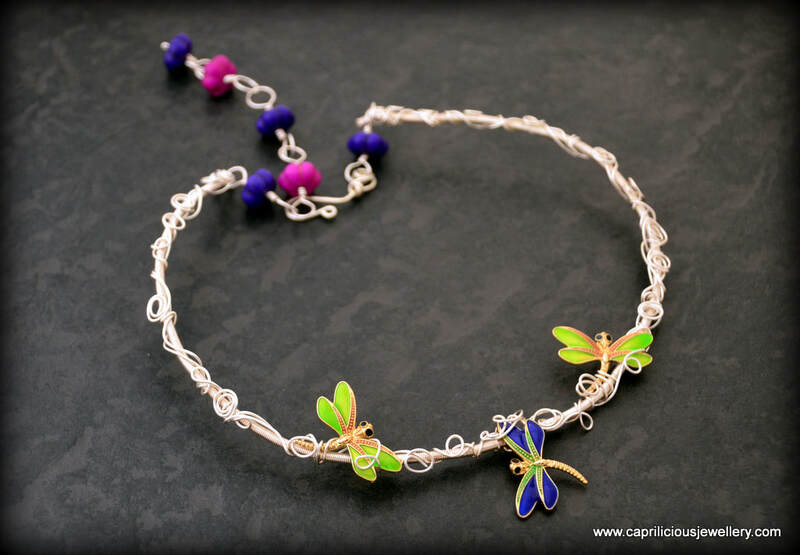 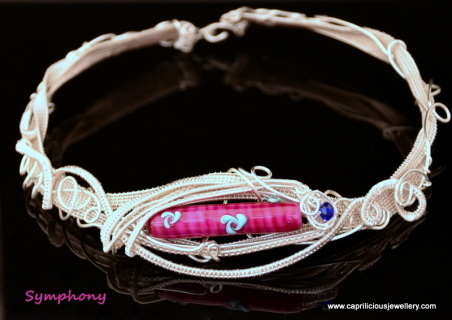 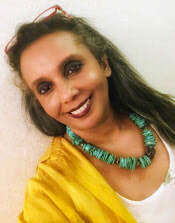 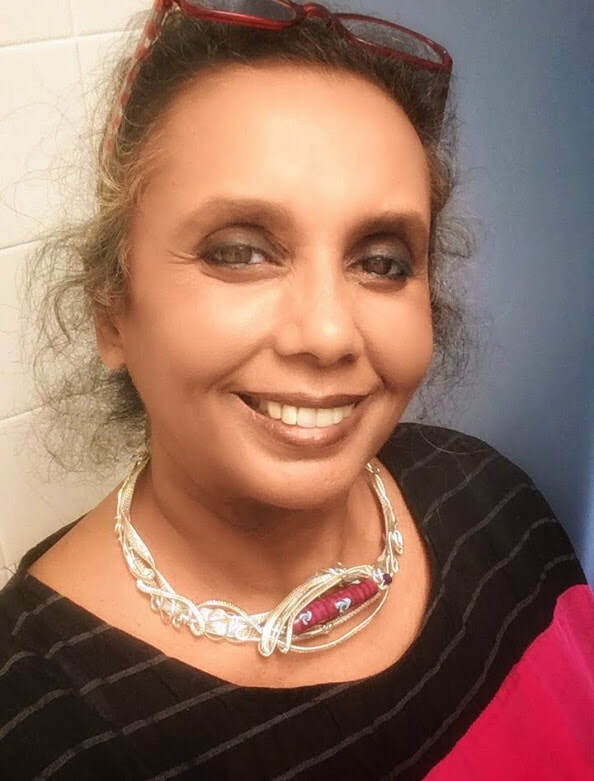 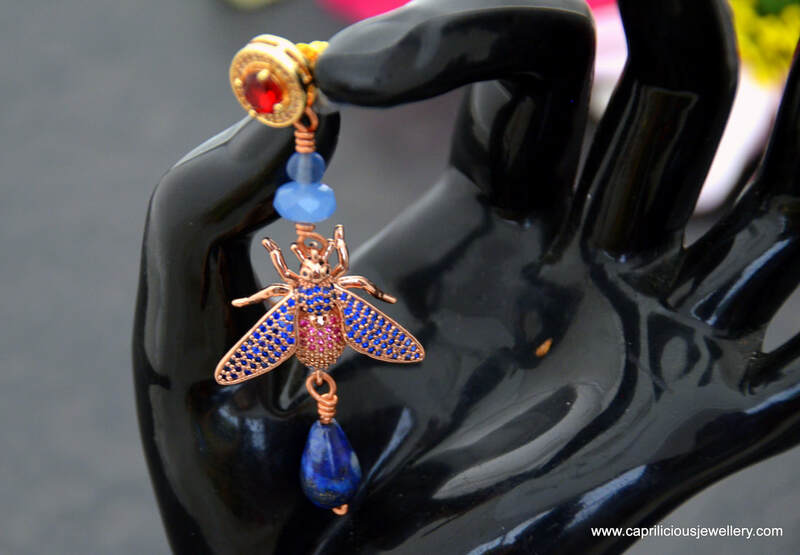 The toggle clasp is in the shape of a dragonfly.The necklace reminds me of a party on a hot beach in Goa - fun all the way! 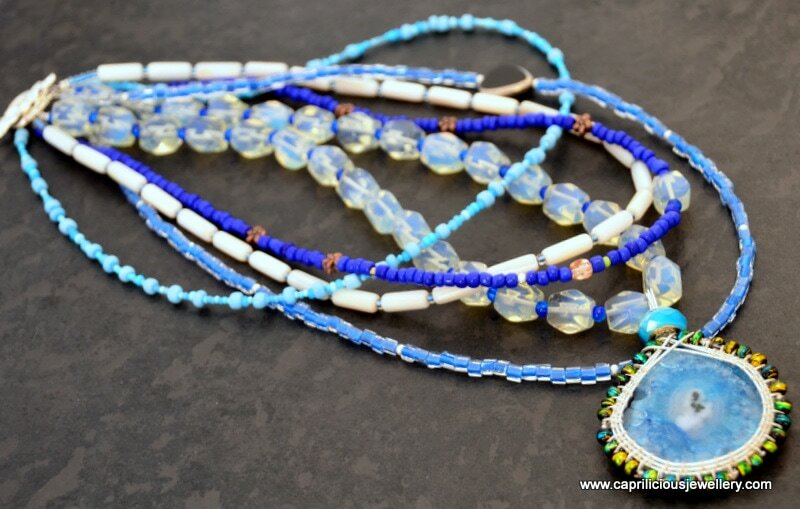 Definitely a necklace for a summers day with it's crisp blue and white look. 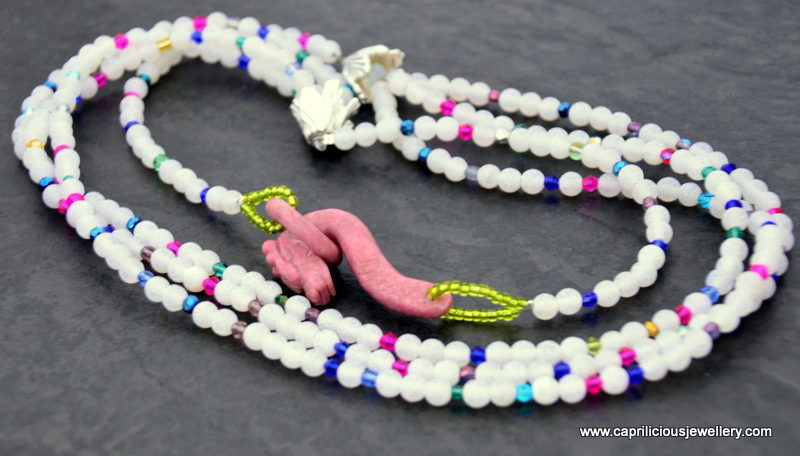 23" long, this three strand necklace has opaque crystal beads and dyed jade teardrop beads all mixed together with gay abandon. 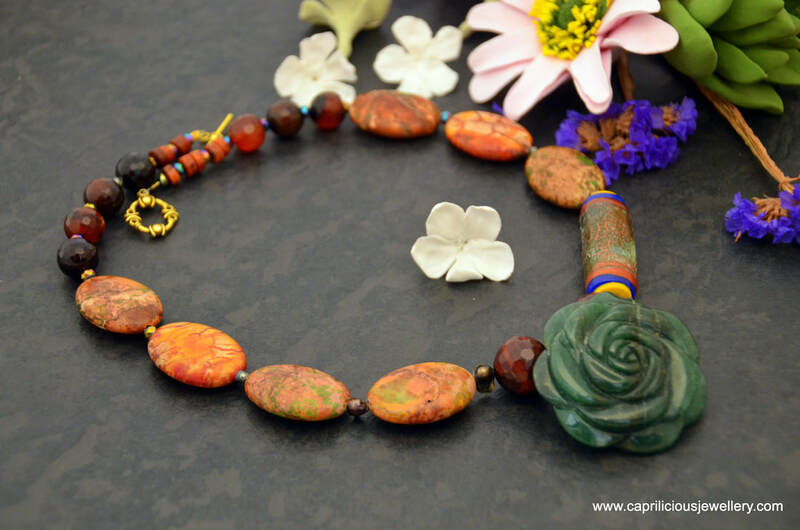 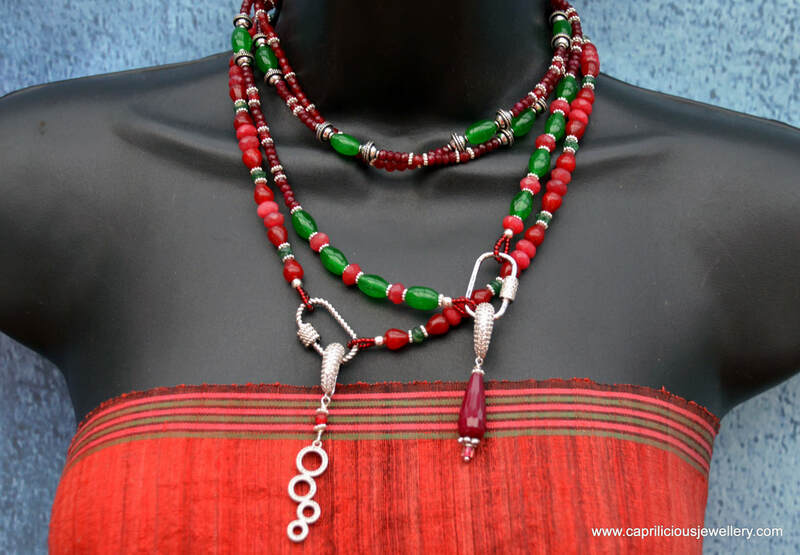 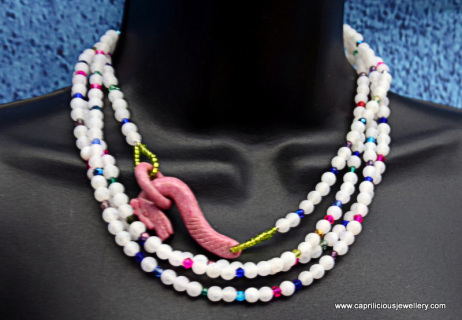 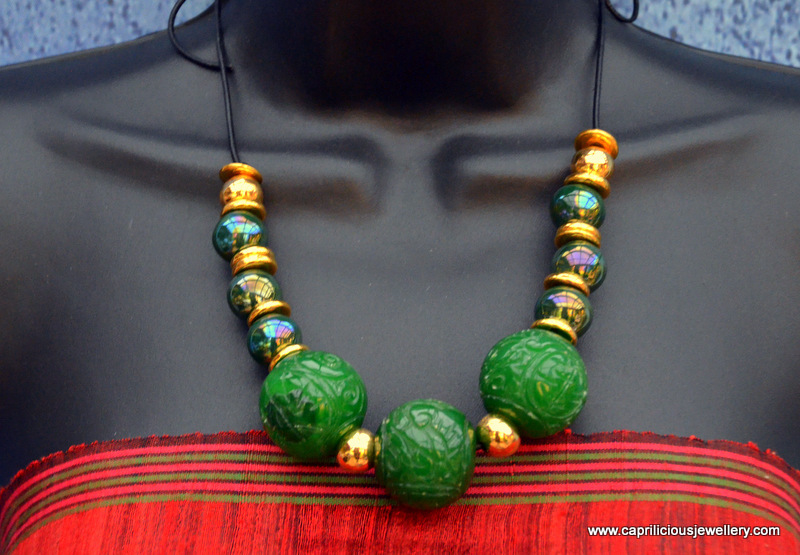 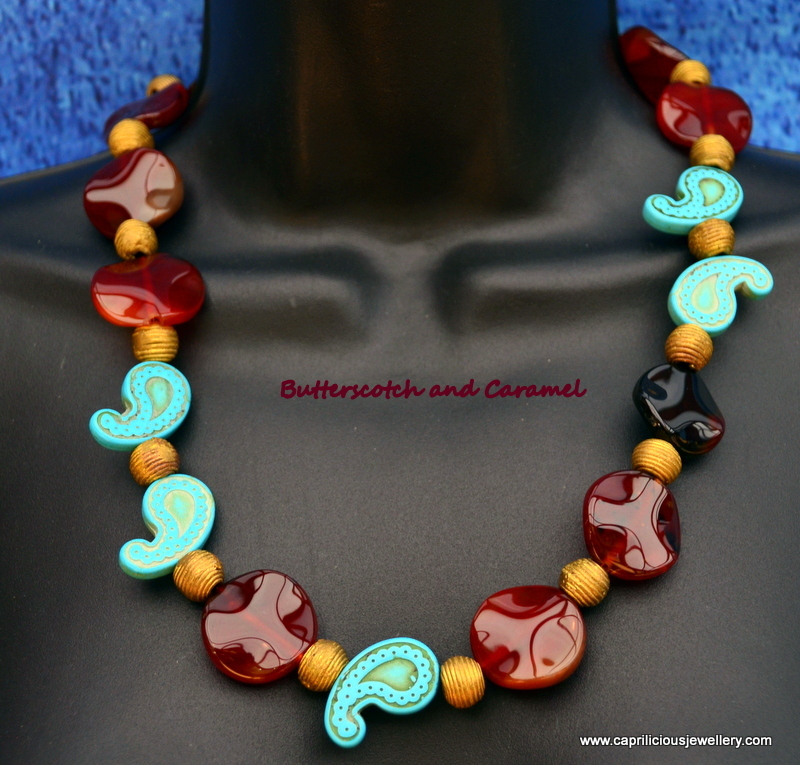 The bright colours will take you antwhere in summer and elevate your mood in winter - an all year round necklace. 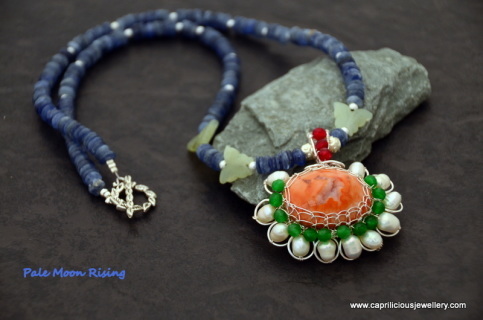 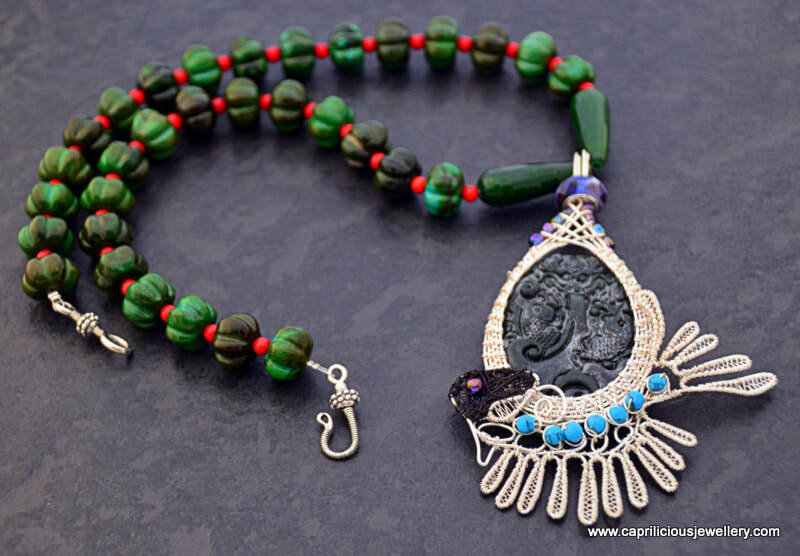 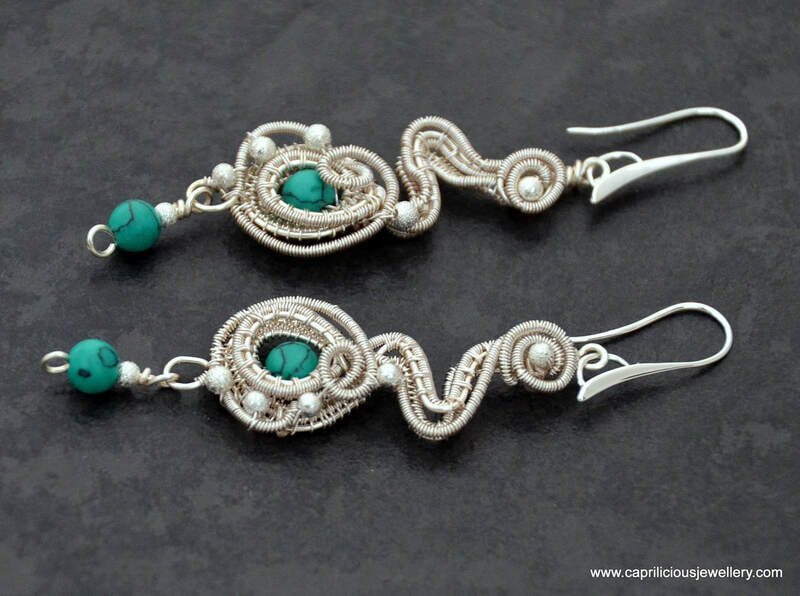 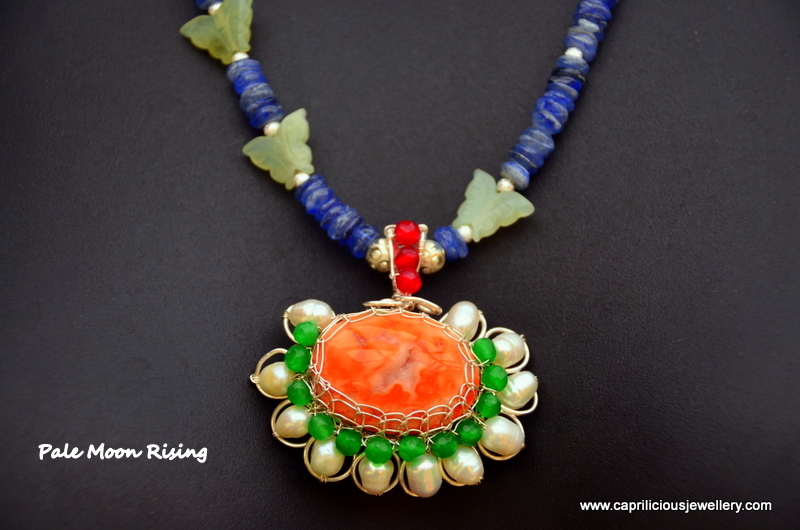 A carved aventurine rose in a stainless steel surround forms the clasp. 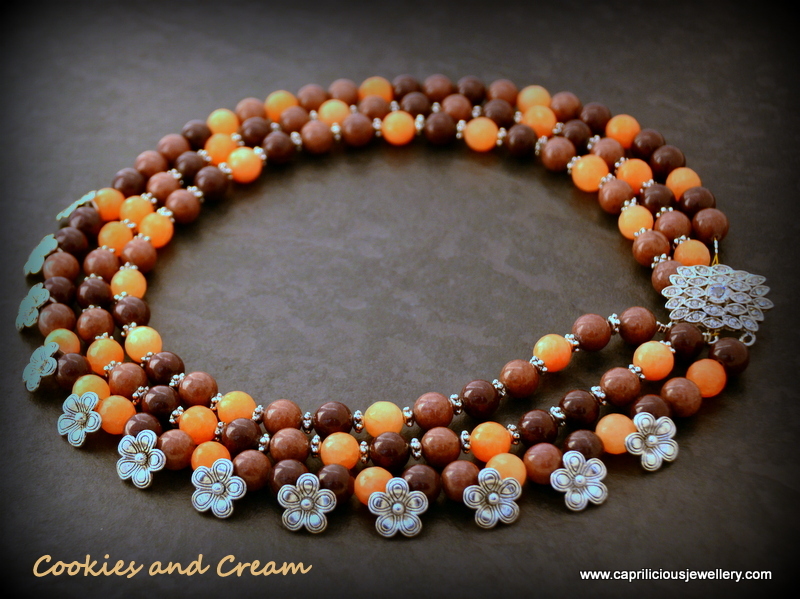 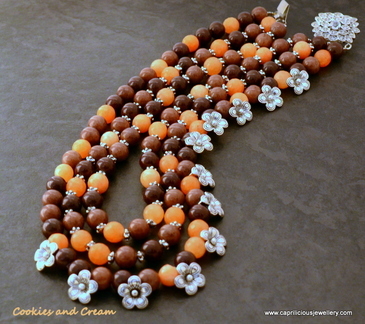 Three strands of jade beads in ombre cookies and cream colours held together by a diamante studded clasp worn to one side to show off the flowers that are placed on the lowest strand of the necklace. 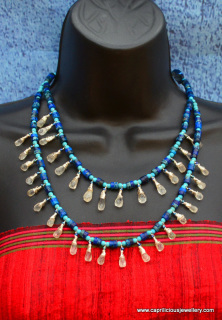 The necklace is 22" long and the shortest strand sits close to the neck. 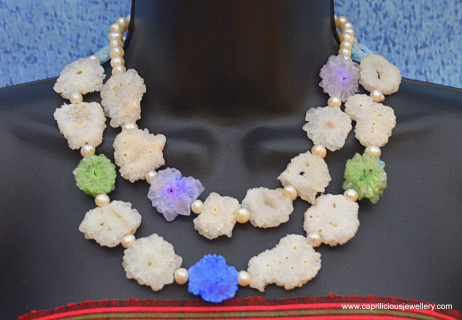 This mutistrand necklace is made of amethyst quartz beads, accented by electroplated crystals, baroque cream coloured freshwater pearls, Czech glass beads in various shades of silver and pale pink. 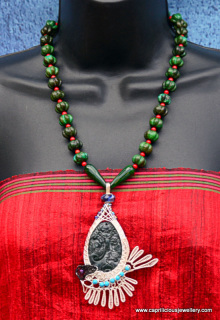 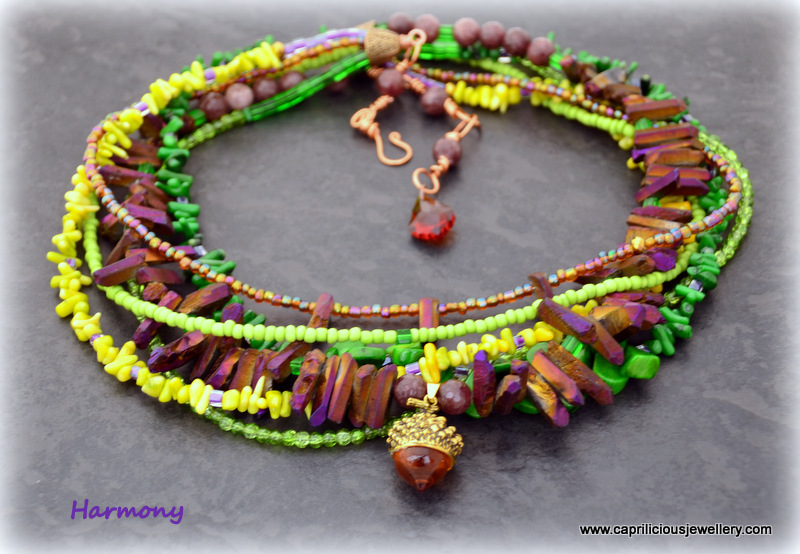 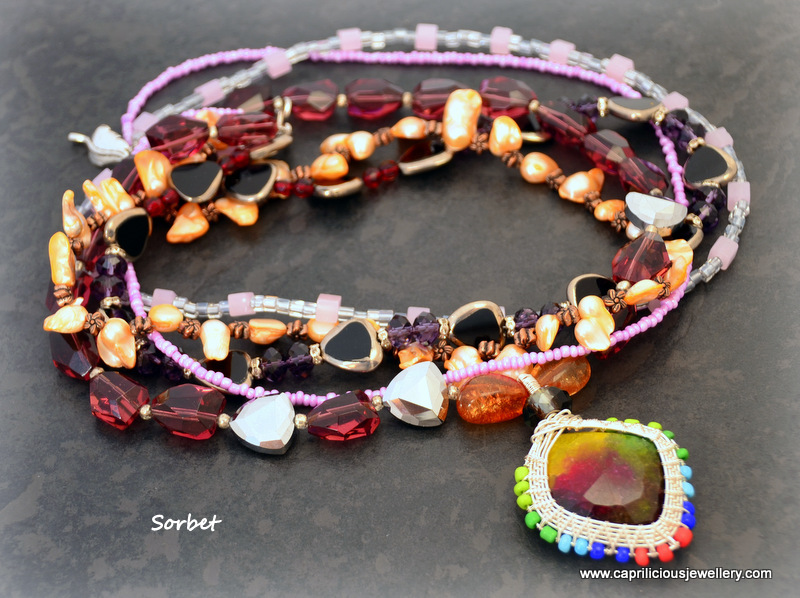 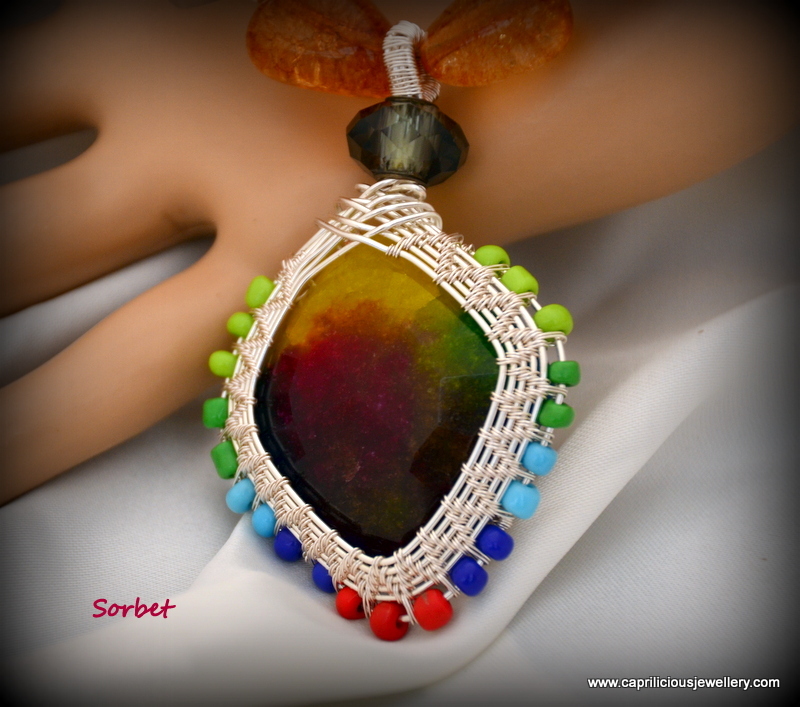 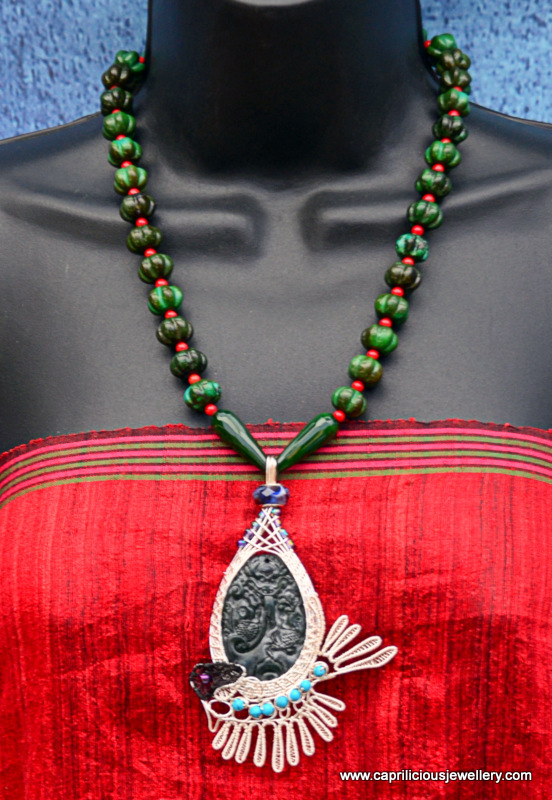 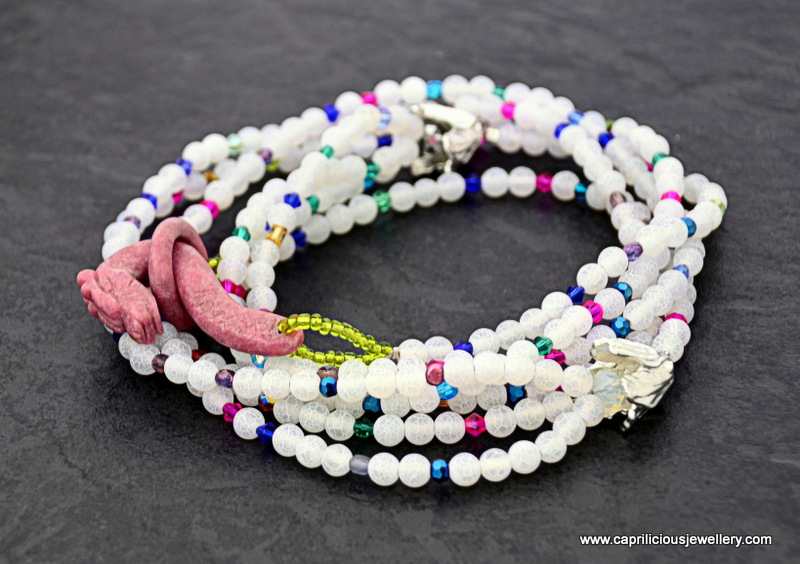 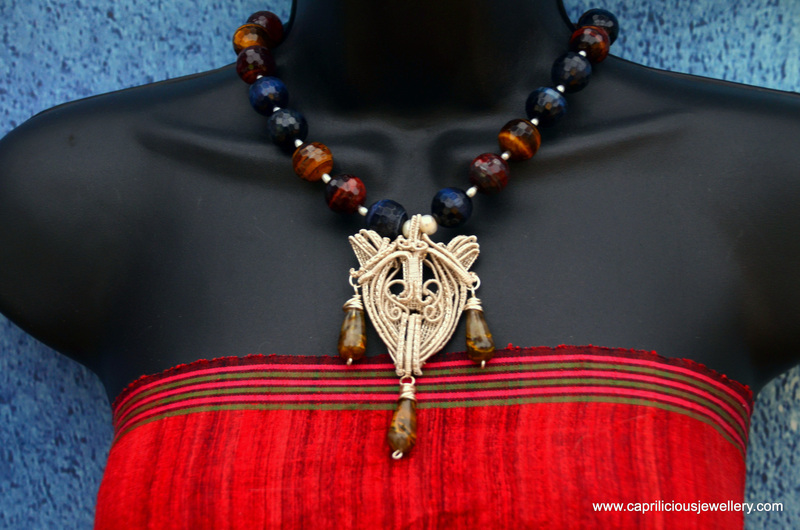 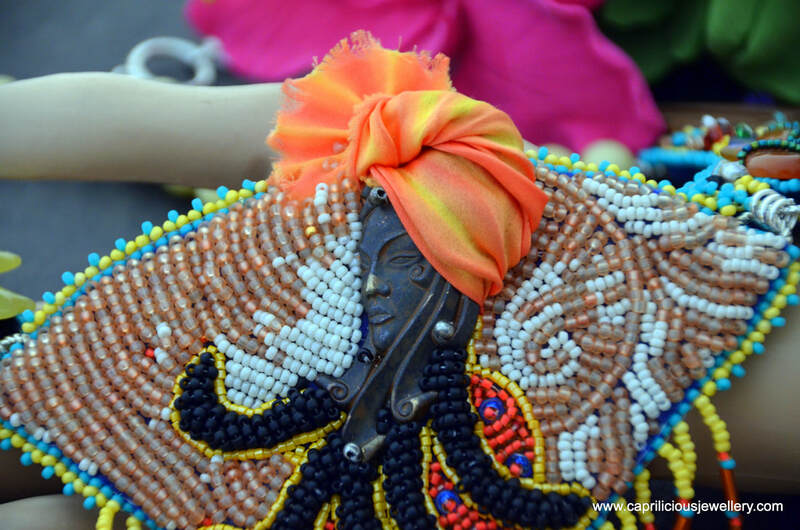 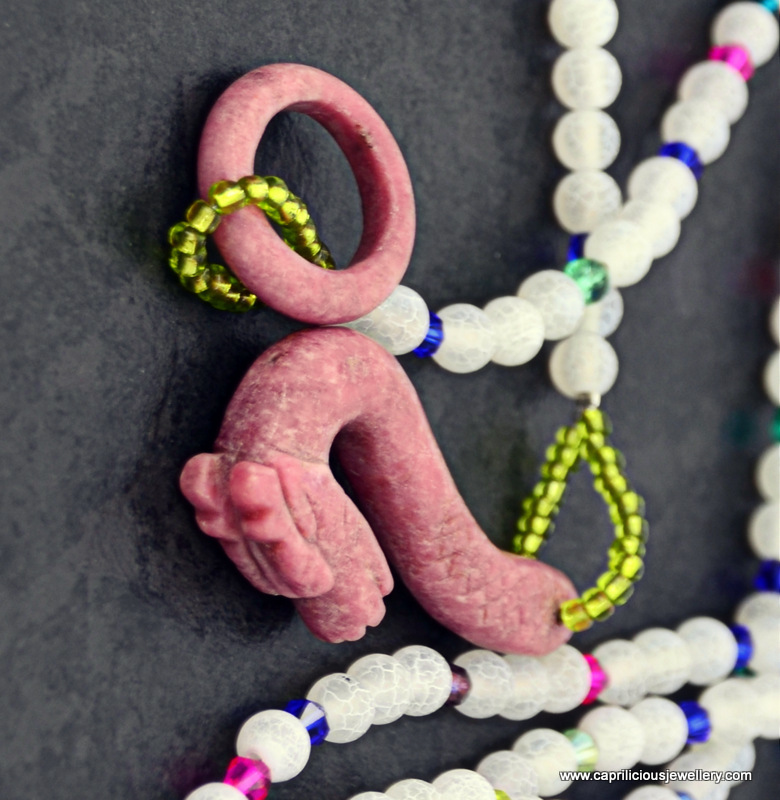 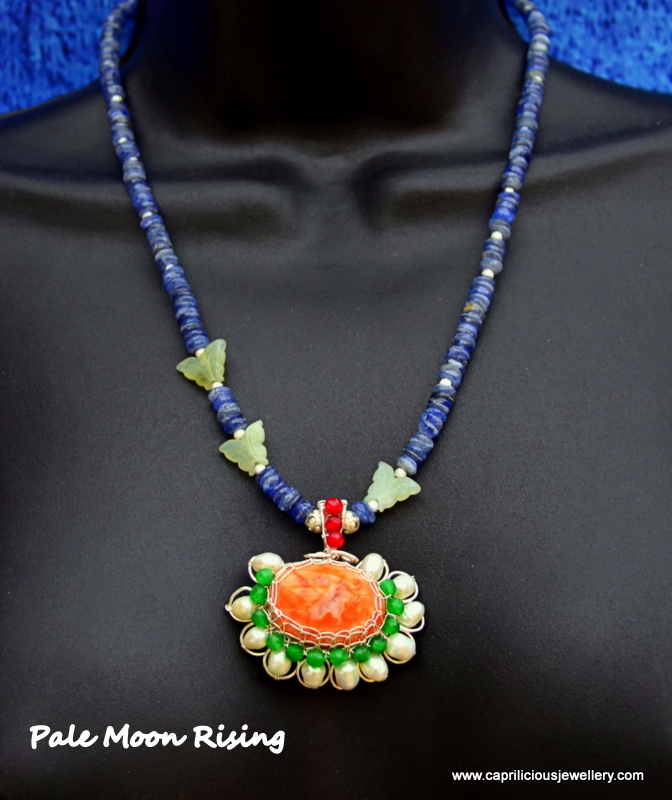 It carries a dyed quartz pendant, set in wirework and accented by colourful seed beads. 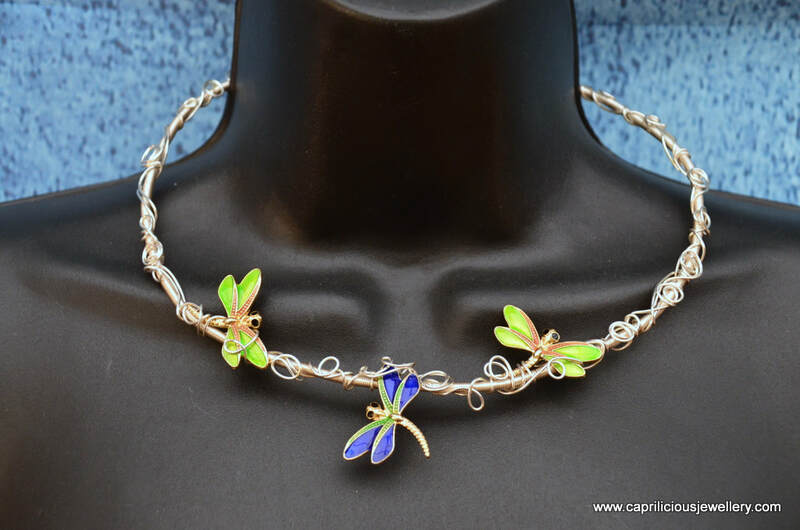 The necklace is 23" long and has a leaf shaped hook clasp. 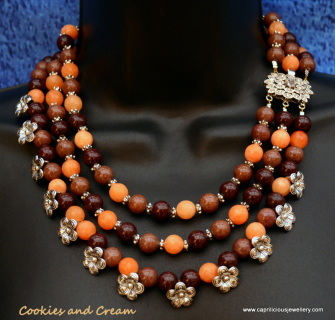 A daytime necklace that is both elegant and contemporary and has the bohemian chic look that is all the fashion today. 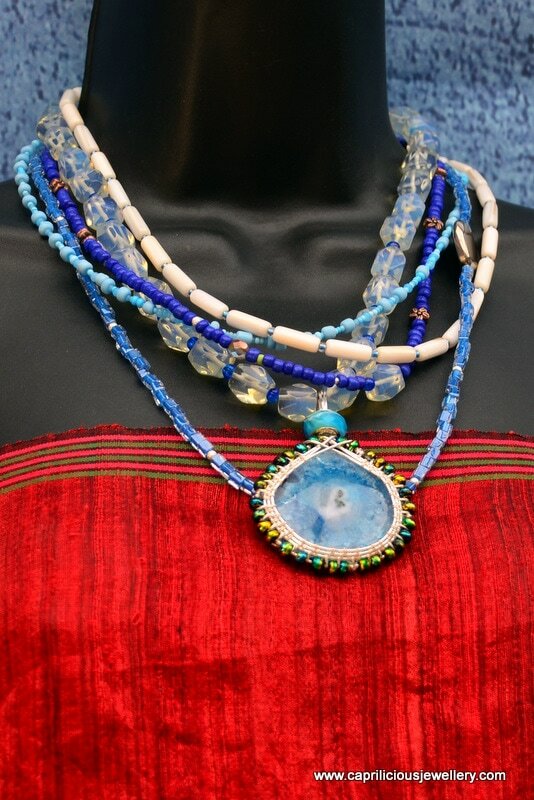 21" of kyanite, shimmering an icy pale blue in a flirtatious little necklace with three pale green jade hand carved butterflies. 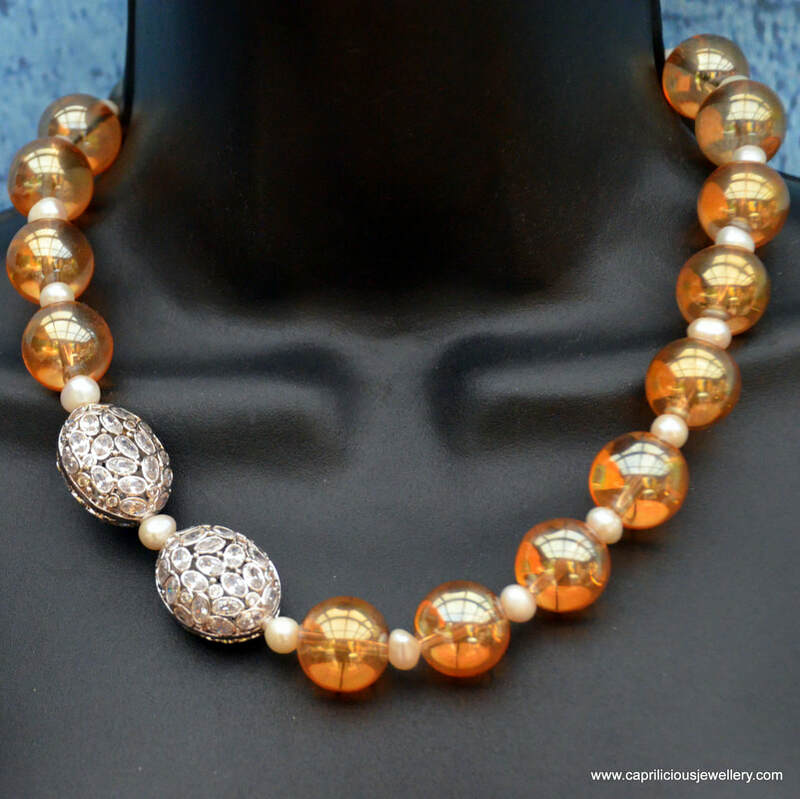 The pendant is a stylish peach coloured druzy, set in tarnish free silver plated copper wire, embellished with onyx beads and freshwater pearls.